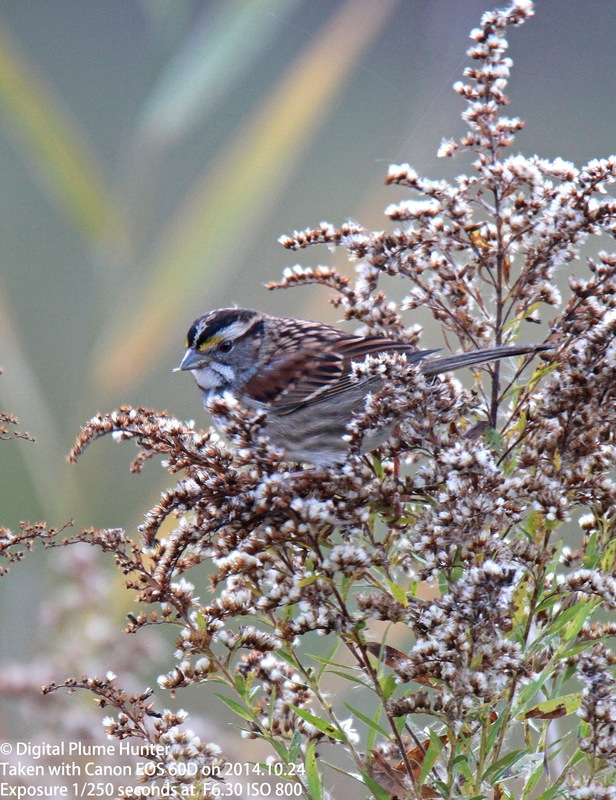 White-throated Sparrow is an abundant species across North America with a population, though declining, estimated at 140 million -- that's almost one sparrow for every two humans in the US. 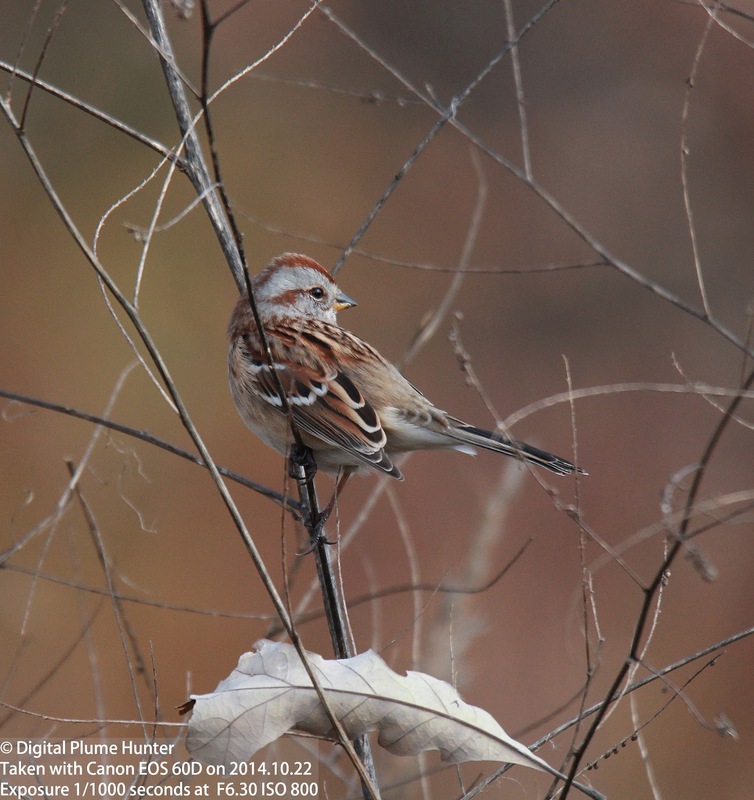 Breeding mainly across Canada, these distinctive sparrows move south to the US in winter. 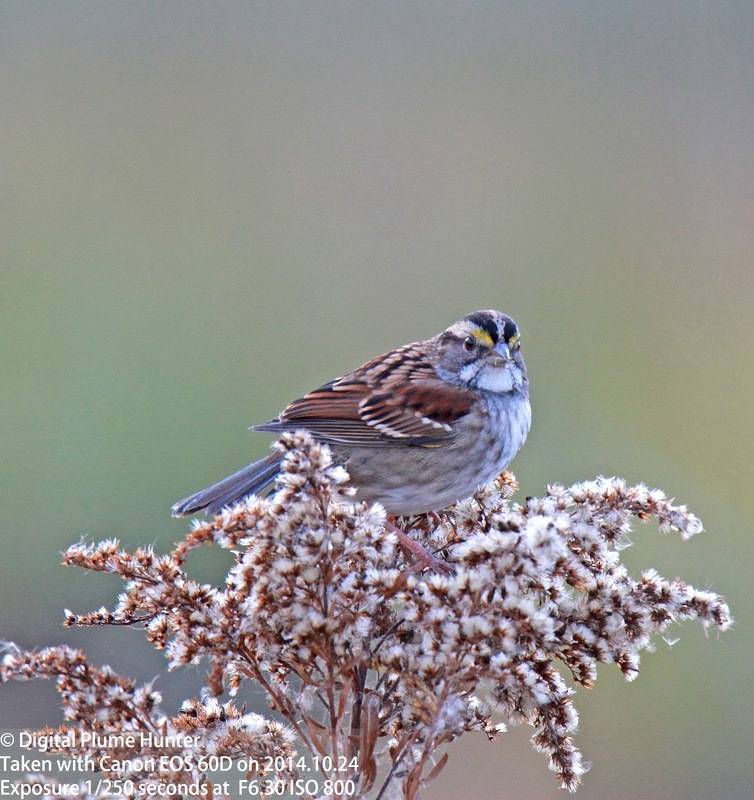 The yellow lores, white throat and supercilium, black eye-stripe and whiskers are all distinctive identification features of this sparrow. 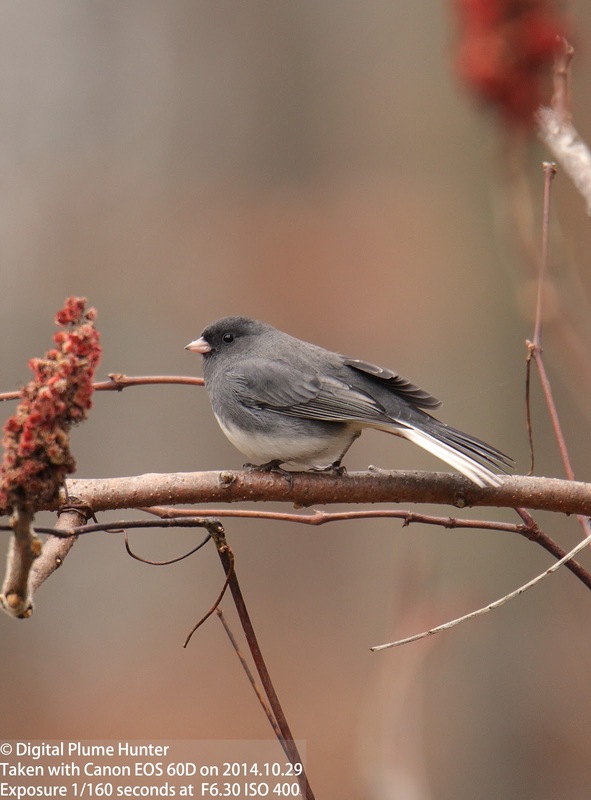 In contrast to the White-throated Sparrow, the Dark-eyed Junco lacks the complexity of facial markings -- presenting simply a pink bill set against a slate-grey face with a dark eye (compare with Yellow-eyed Junco). 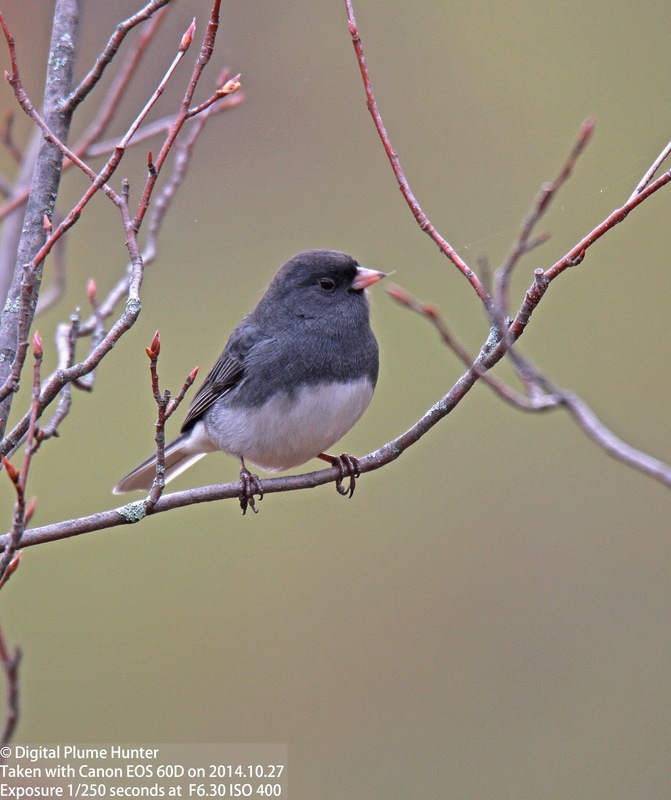 The Dark-eyed Junco comes in several races including the Oregon as well as the Grey Headed subspecies. 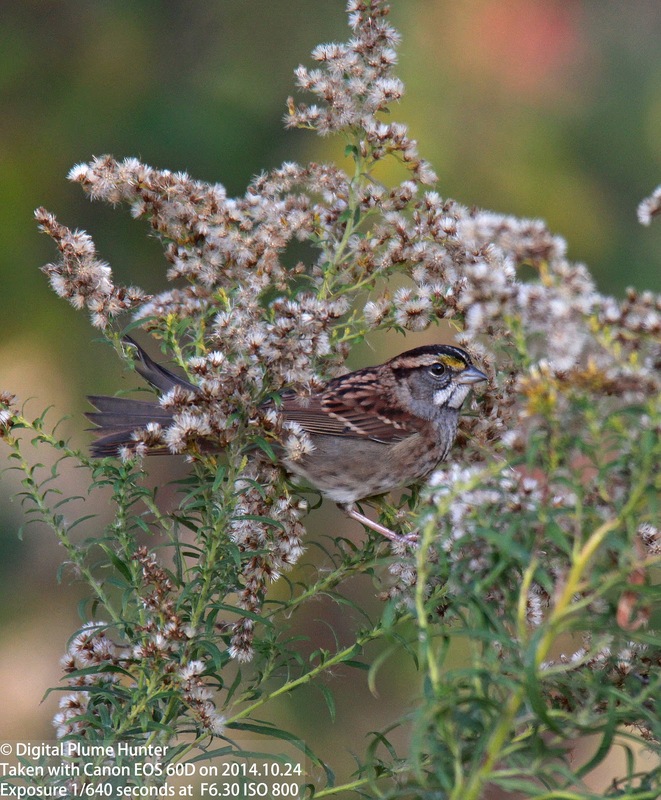 The white flash of the tail (see above) is distinctive as these small sparrows flit about the shrubbery looking for seeds to eat. 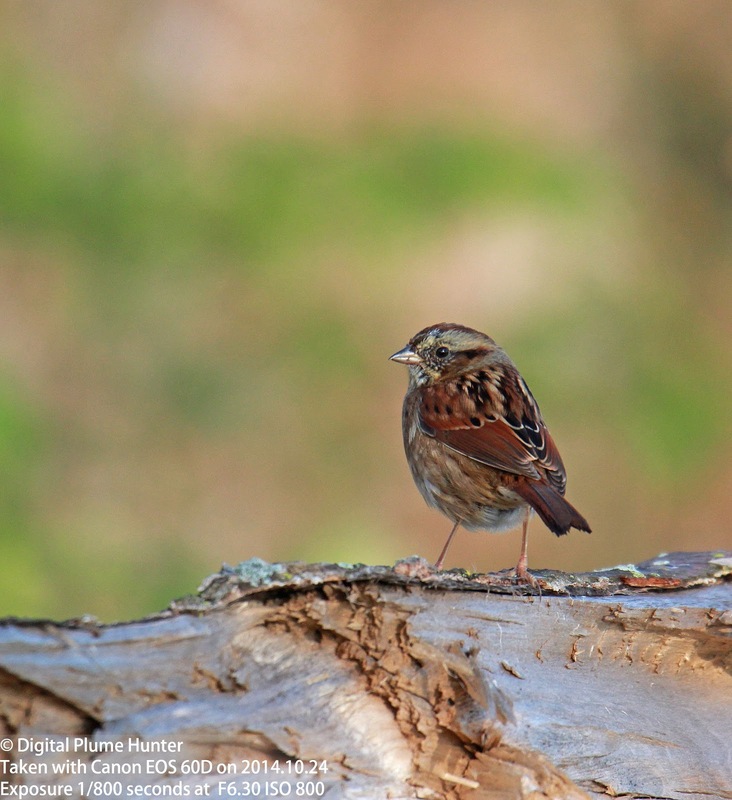 Not terribly visually distinctive (unlike, say, the spectacular Olive Sparrow which has an unparalleled and unmistakable dark green back); this sparrow, however, more than makes up in song what it lacks in looks. 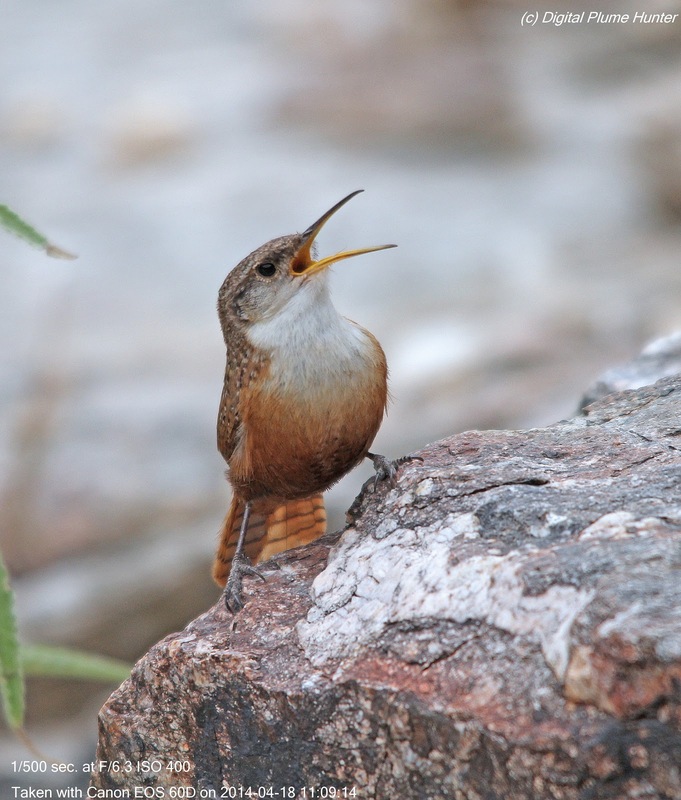 Its stuttered, loud trilling is an indelible musical feature of marshlands in Spring and Summer. 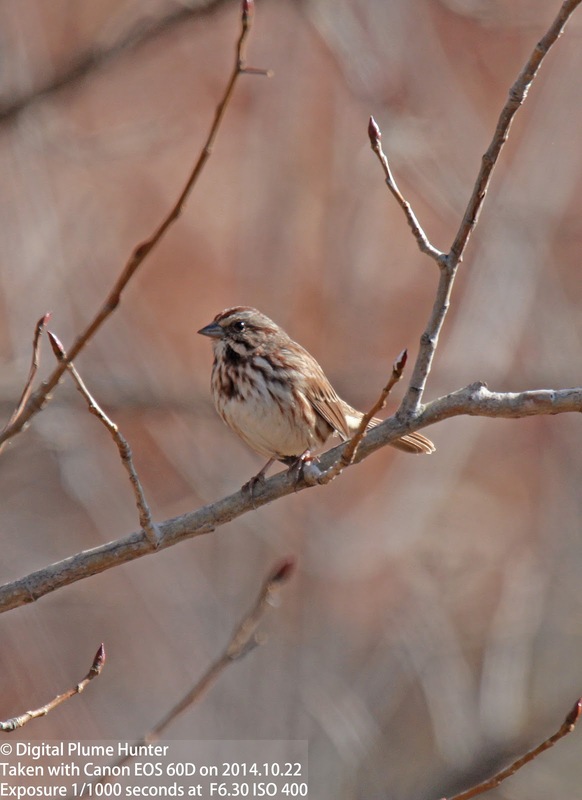 Lacking the bold streaks of the Song Sparrow on its chest, Swamp Sparrow is a richly russet sparrow with a white throat and grey, un-striped chest. 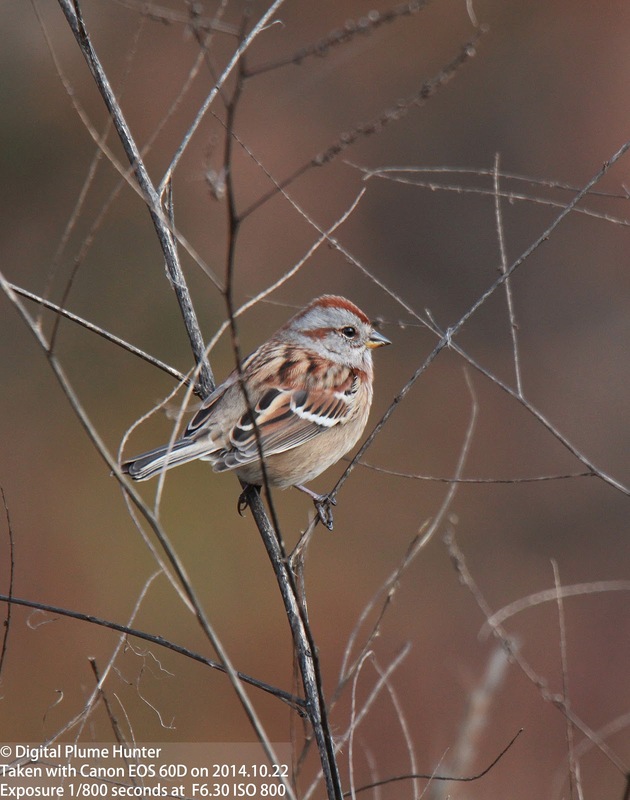 A winter resident, these distinctive sparrows are a familiar sight in fields of tall grass and shrubs. 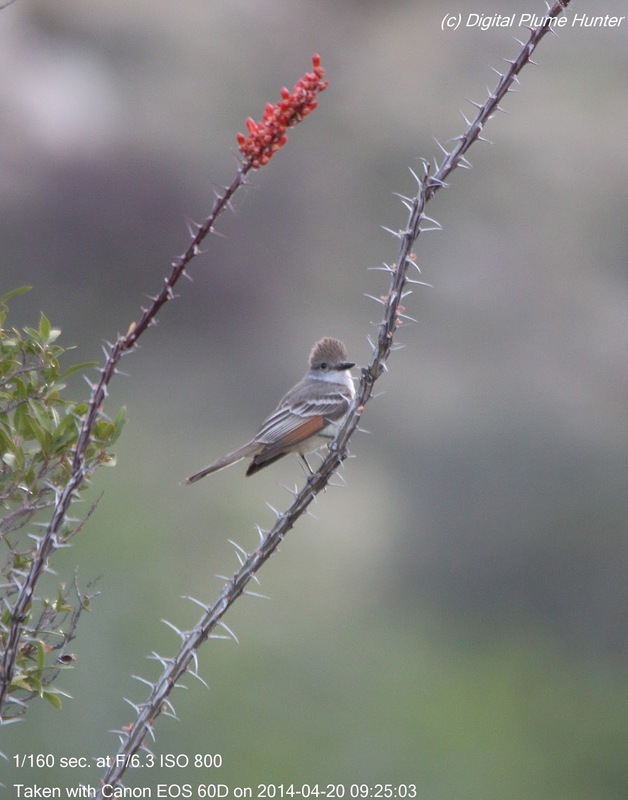 This is our (as in those that live in the Eastern US) only Towhee -- a group of large, rotund sparrows that find their center of diversity and abundance in the West and Southwest of the country with signature species such as Abert's Towhee, California Towhee and the very special Green-tailed Towhee. 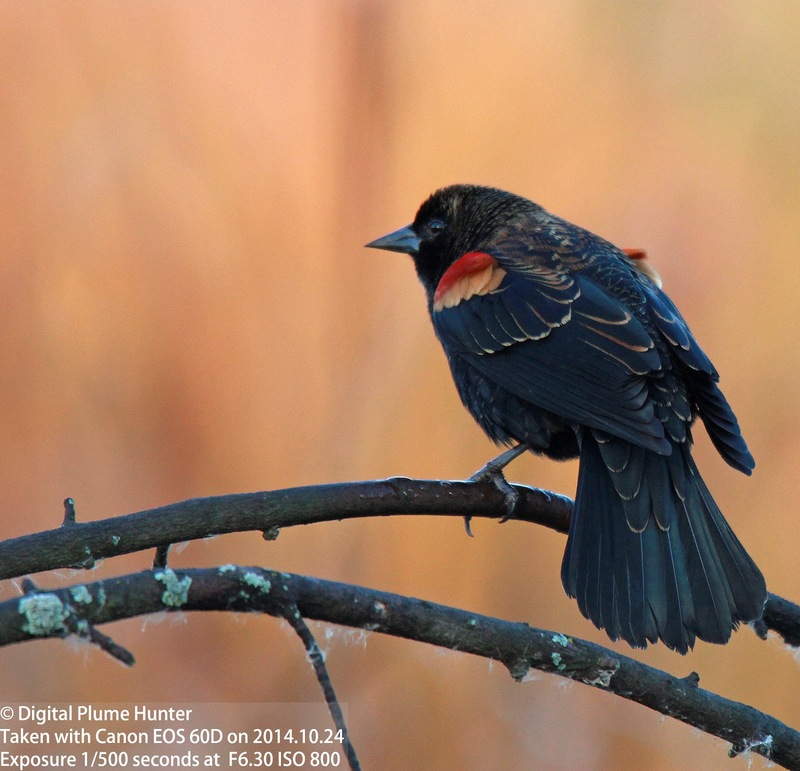 While warblers, tanagers and grosbeaks steal the show with their colorful flamboyance in Spring, the Sparrows gain ascendancy in the Fall as the former scurry away to tropical climes with the approach of Winter's colder temperatures. 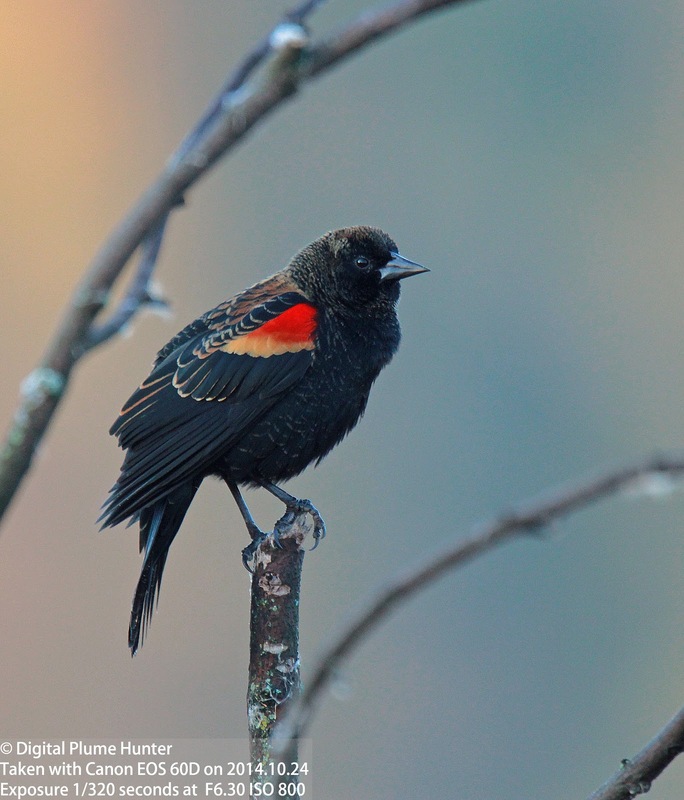 The family of American finches boasts a wide array of finches, grosbeaks and crossbills. 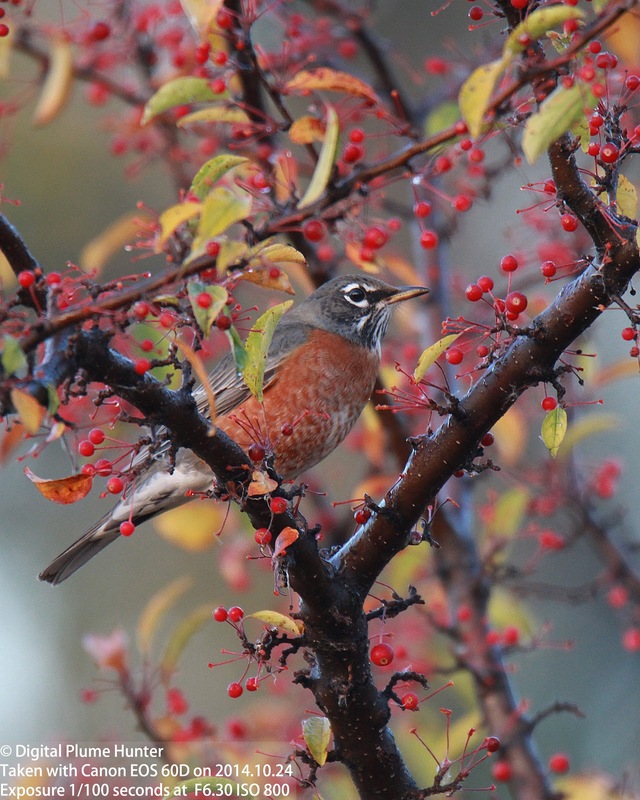 Some are truly spectacular -- such as this blogger's personal favorite: the Rosy Finches. 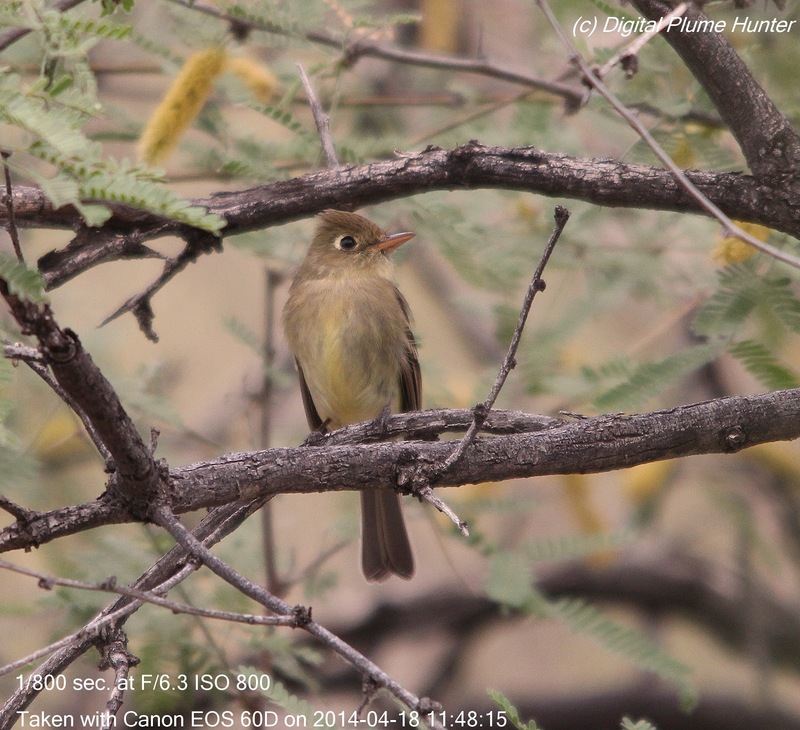 However, there's more to finches than the rather small-ranging and hard-to-see iconic rosy finches of the West. 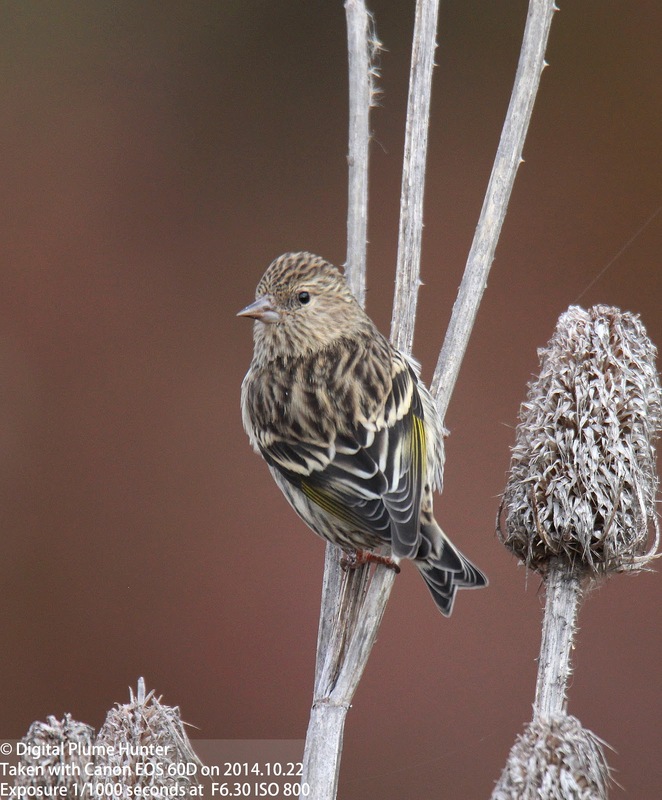 And, a prime example of a finch that is both delightful and yet fairly common across all of the US is the Pine Siskin. 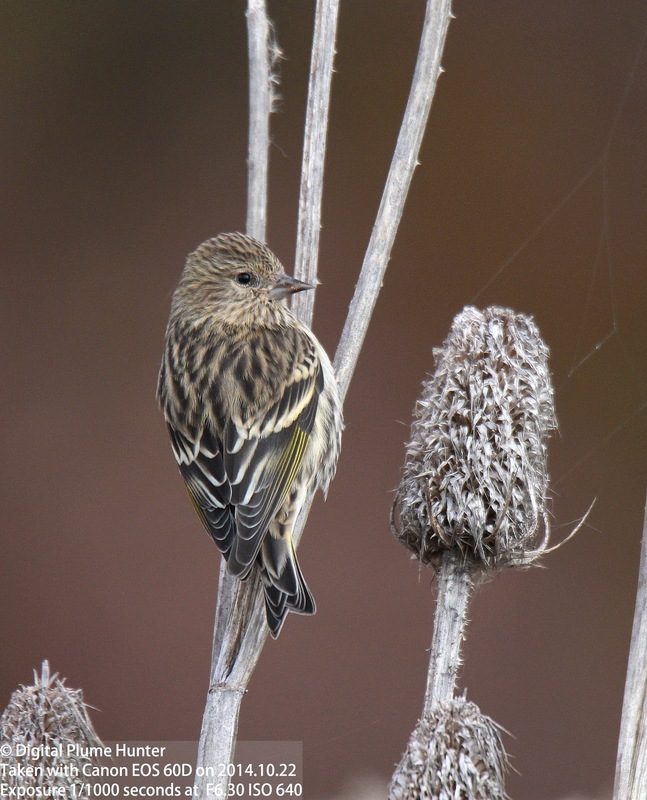 Famous for its periodic irruption, Pine Siskin numbers can spike unpredictably year over year; but, the best chance of seeing one is definitely going to be in Winter -- a time when they can range as far down as Texas (eg., in Hueco Tanks) but rarely as far as in Southern Florida. 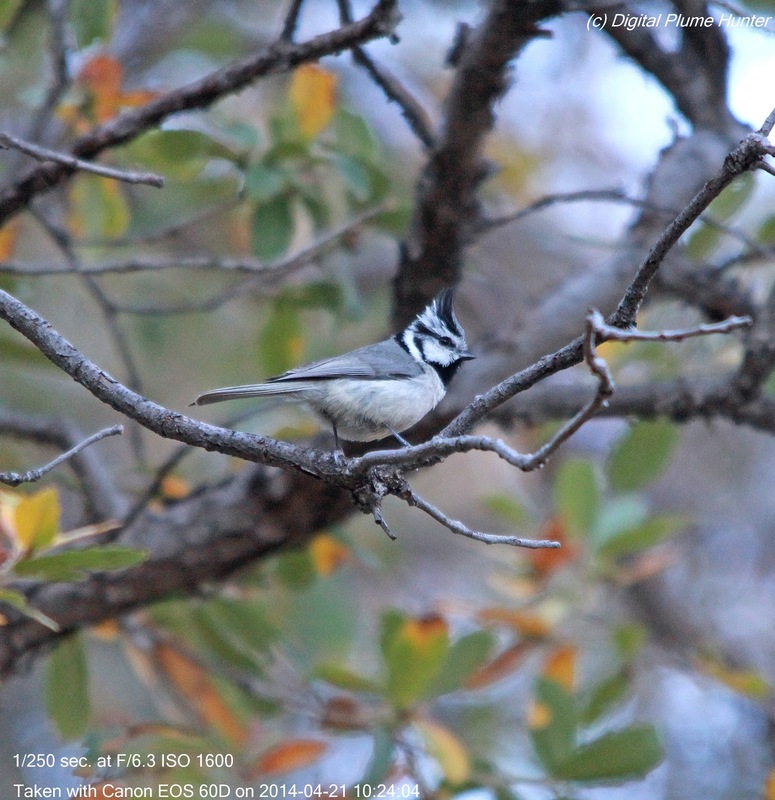 Wetzel SRA is open to hunting starting September 1st and during this blogger's brief visit, more hunters than siskins were observed. 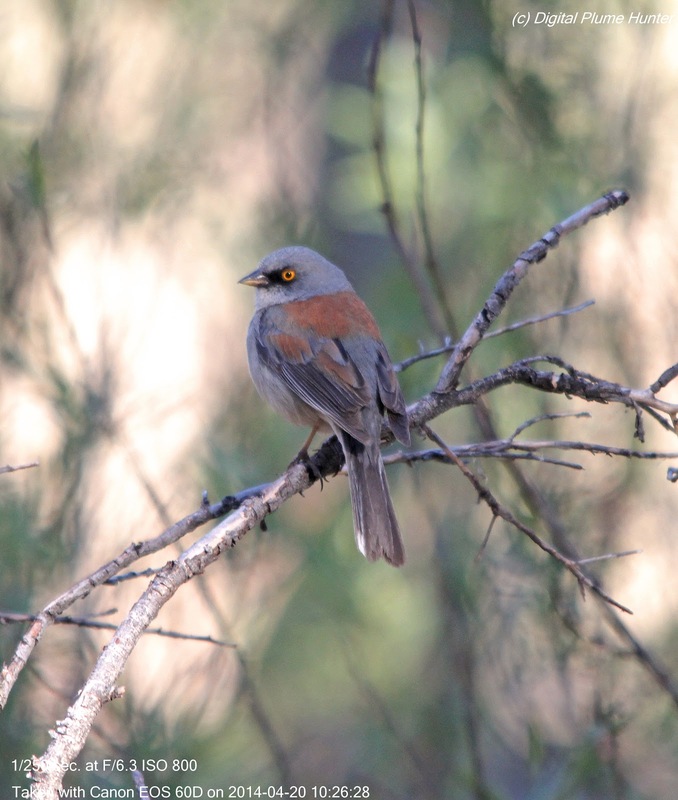 While the identification characteristics of the former are somewhat more obvious (it's hard to ignore shotguns, orange vests and hunting dogs-in-tow); the latter may be identified by heavy streaking, a thin, pointed bill, a strongly notched tail and a conspicuous patch of yellow in the wings. 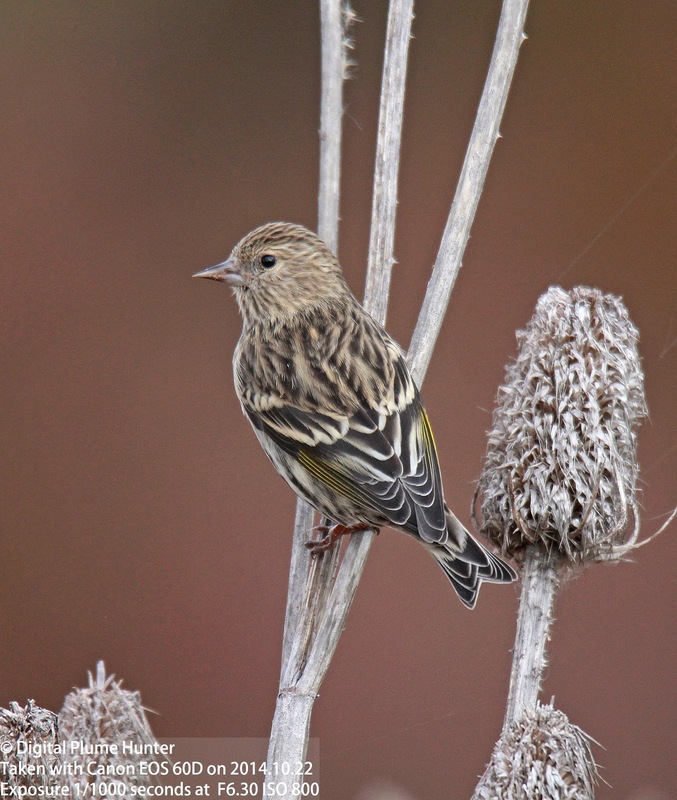 Pine Siskins are both gregarious and noisy; their chattering, buzzing chips are often the first sign of their presence. 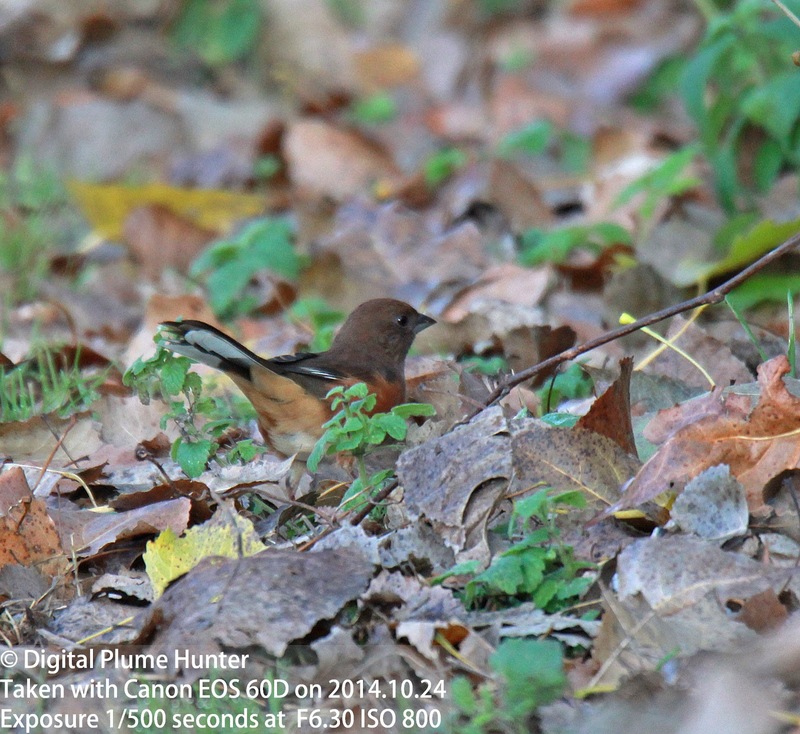 With the Siskin "in the (photographic) bag" (so to speak), this blogger beat an urgent retreat from Wetzel as a result of stern and repeated admonishment administered by the hunters present -- the reason being, and rightly so, for the lack of bright safety-clothing on my person. 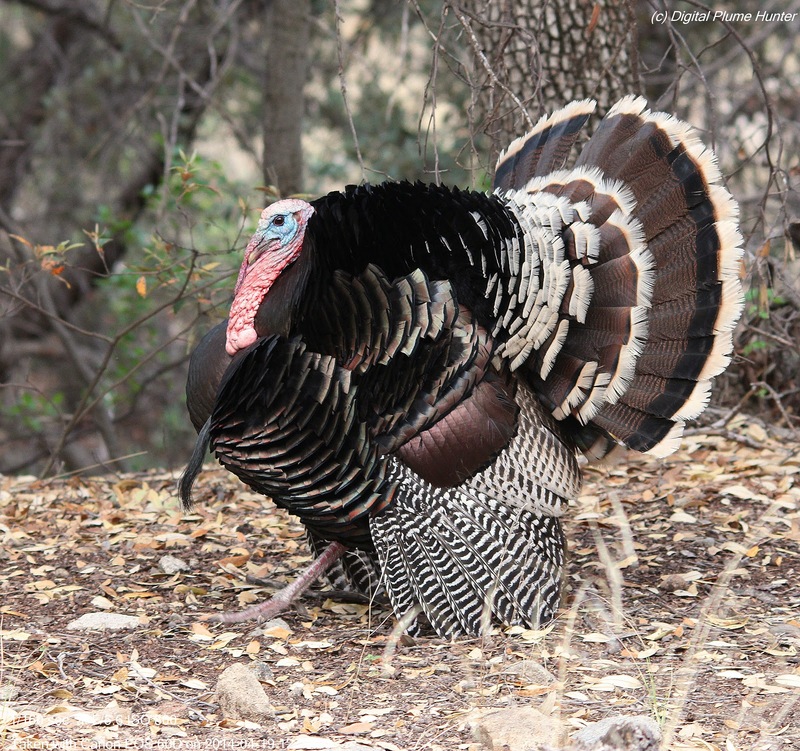 Conditioned, as any birder is, by years of trying to blend into the surroundings, sartorial inconspicuousness is, regrettably, a virtue that can prove fatal in the hunting season. 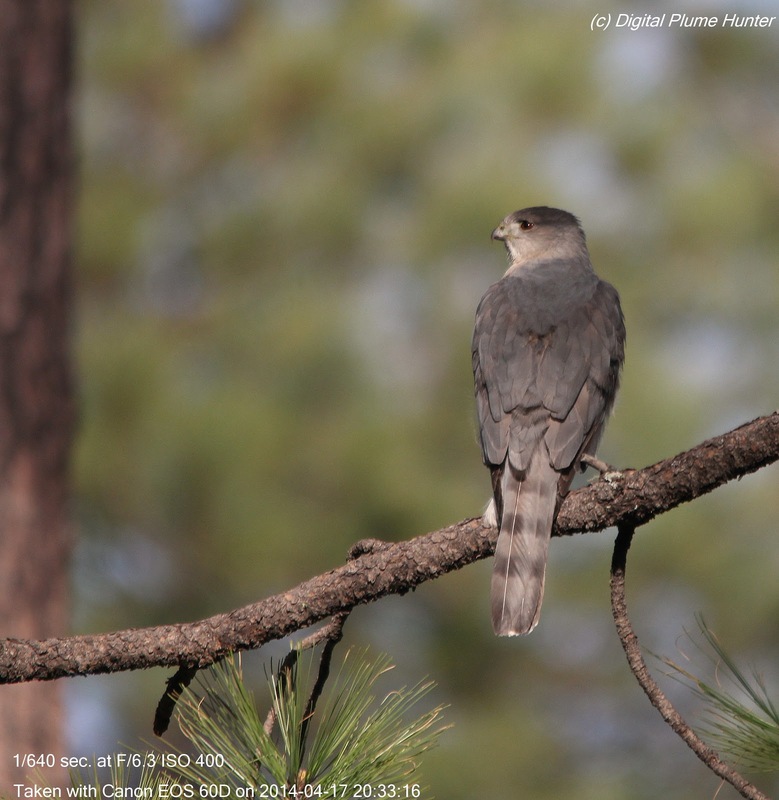 Clearly, "hunting plumes digitally" and "hunting plumes with lead" are vocations that require some important differences in approach. 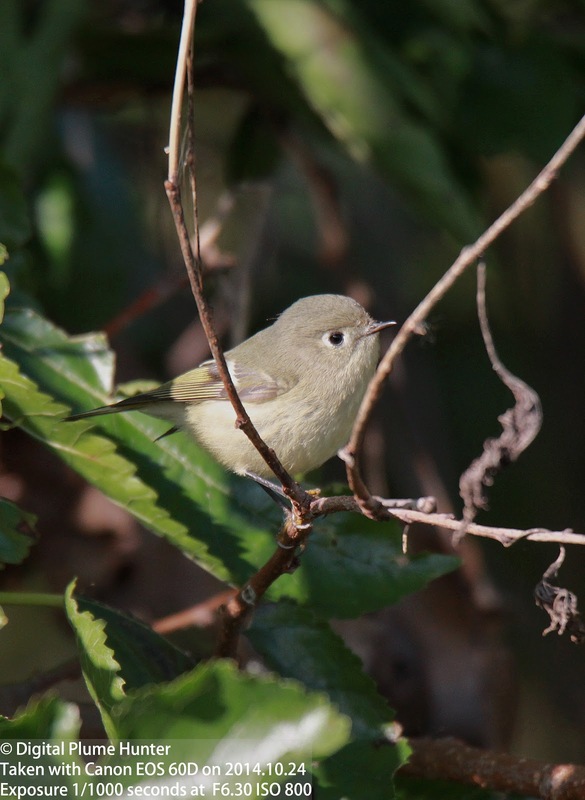 Unlike the dozen-odd species of finch, there are only two kinglets in the US -- the Golden-crowned and the Ruby-crowned. 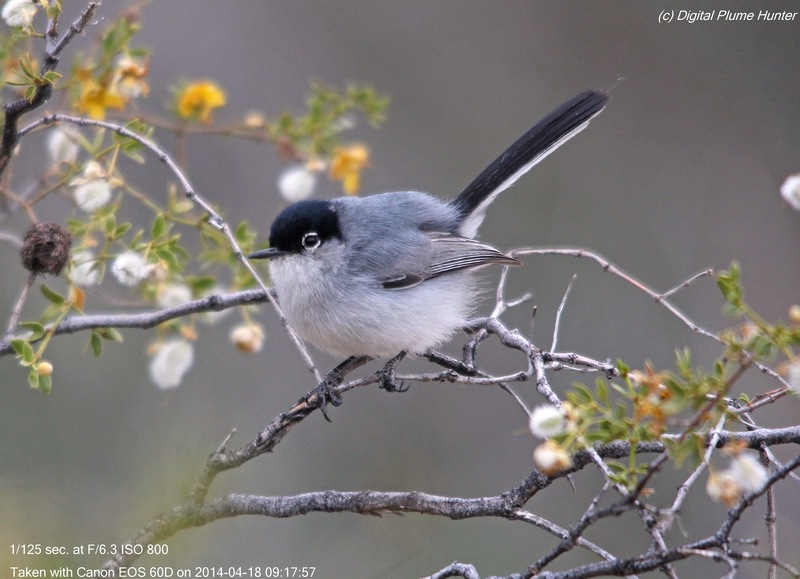 A tiny, olive-drab songster with a prominent white eye-ring and wingbar, this neckless, small-billed feathered wonder, unlike the seed favoring Siskin, is an insectivore. 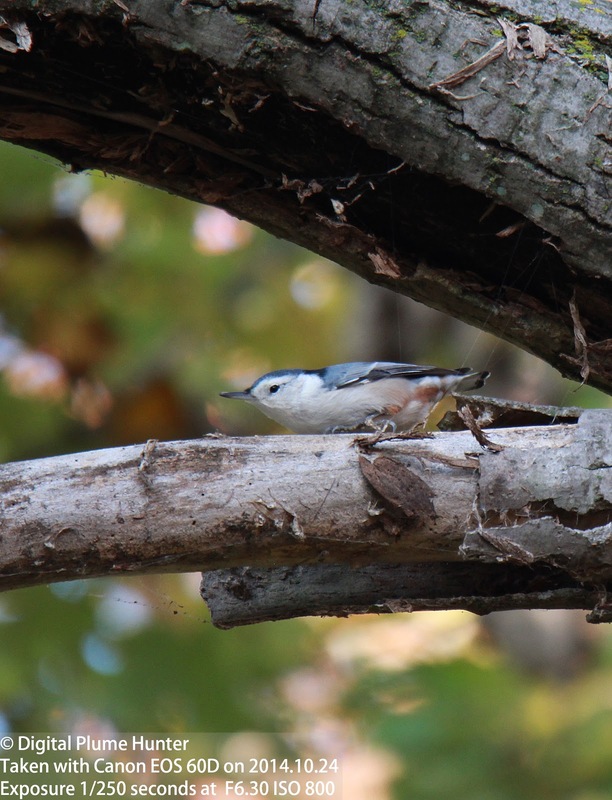 This nuthatch is ripe for a split with studies suggesting 3 (even possibly 4) species. 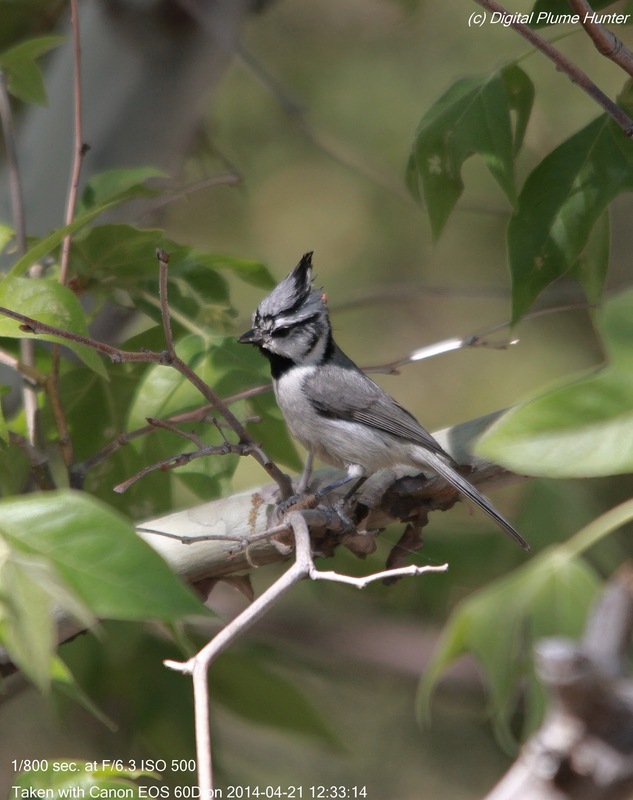 The bird shown here would belong to the "Carolina" species if the split were to go ahead -- with a broad, black crown, pale grey back and buffy flanks. 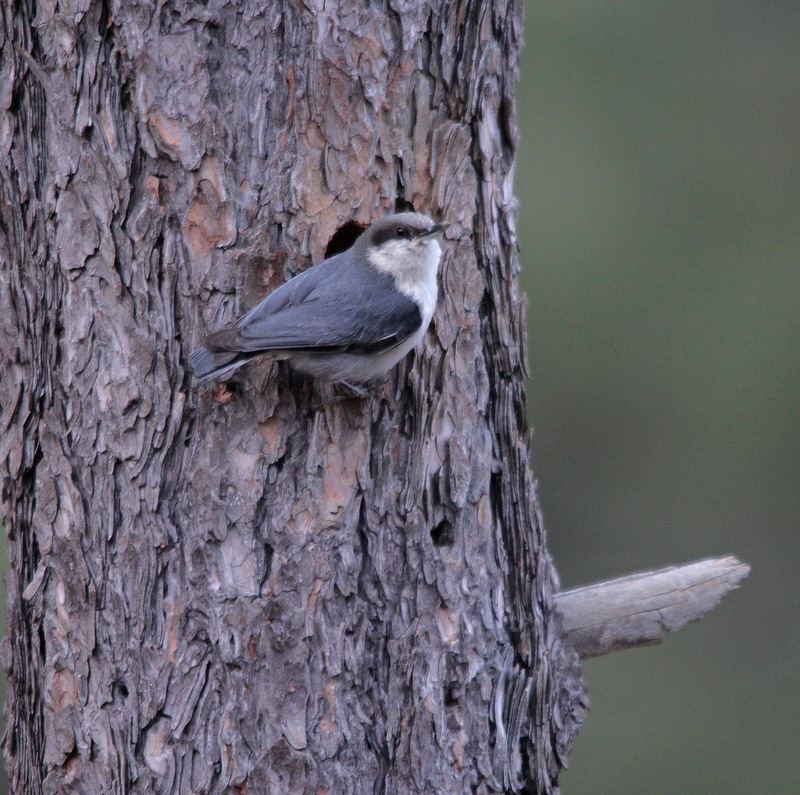 Unlike the finch and the kinglet, the Nuthatch is a year-round resident throughout its range. 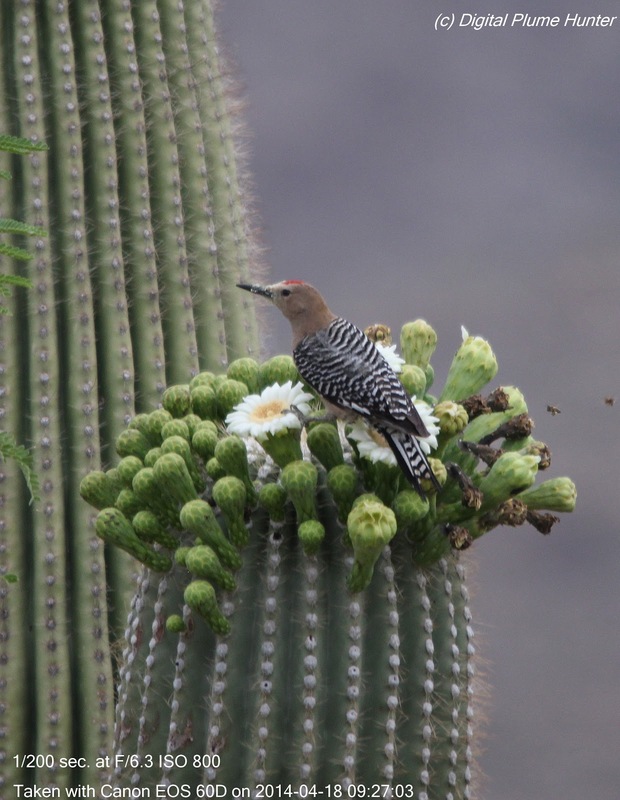 .. .and it has done in its adopted home what Nature demands of it -- adapt and survive. 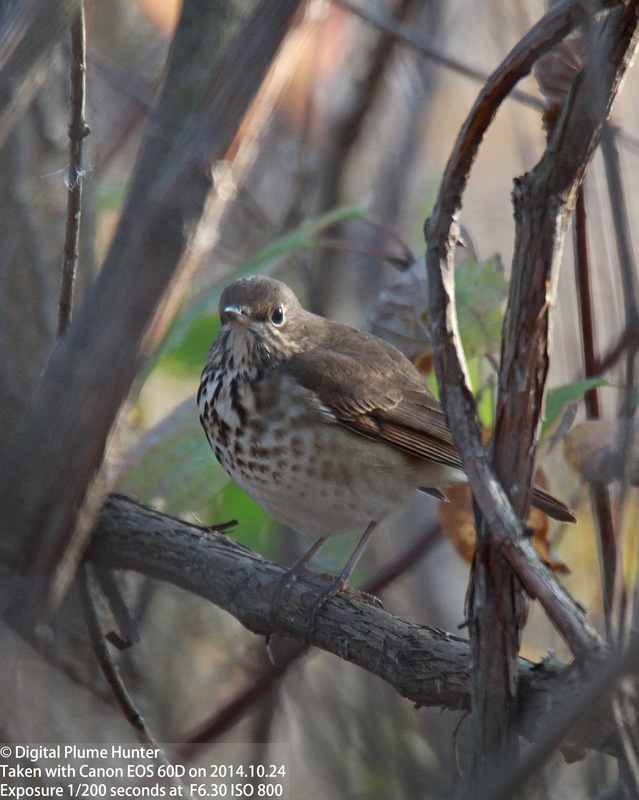 Winter threatens a slower recreational season with colder temperatures and shorter days but delightful arrivals such as the unique Pine Siskin keep the fires of birding aflame. 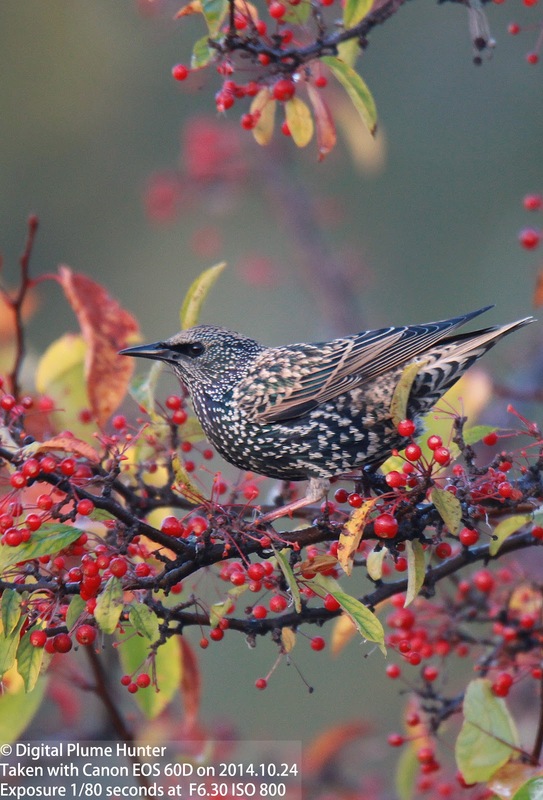 Despite the imposing and somewhat mysterious title of this week's blog, we will not be discussing the celestial bodies of a far off galaxy called Certhioidea; neither shall we be discussing world despots -- indeed, the subject of this blog post is decidedly avian. 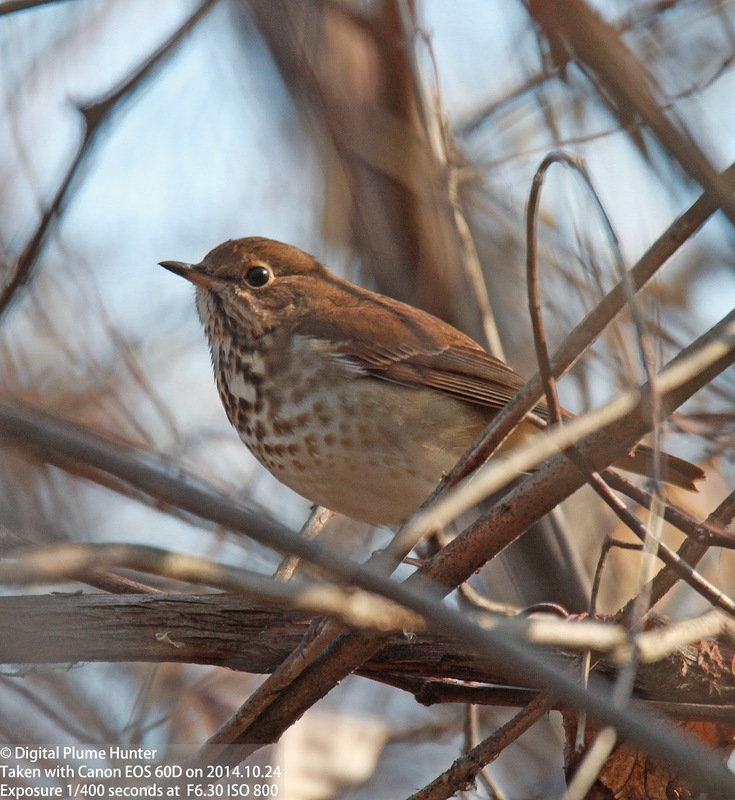 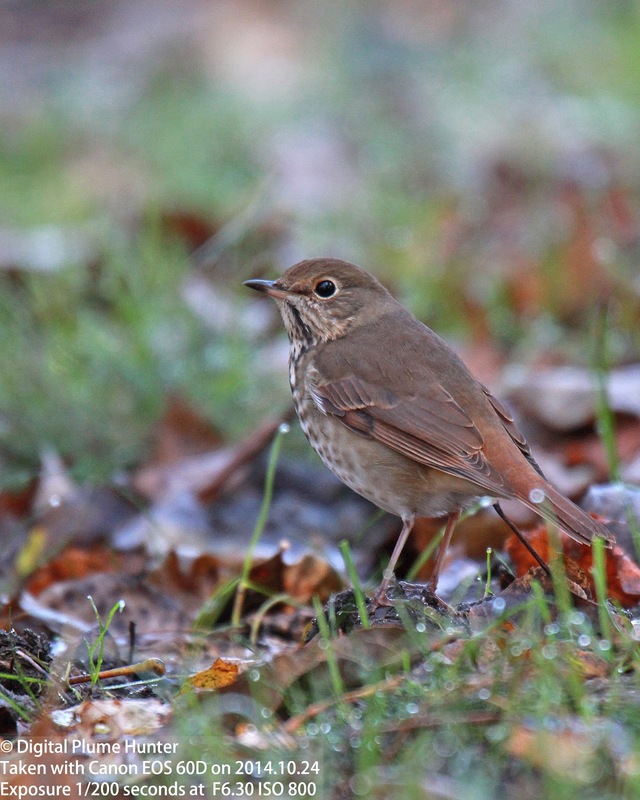 In the hallowed taxonomy of the Aves, the superfamily Certhioidea encompasses some truly interesting species belonging to the Treecreepers, Nuthatches, Wrens, and Gnatcatchers. 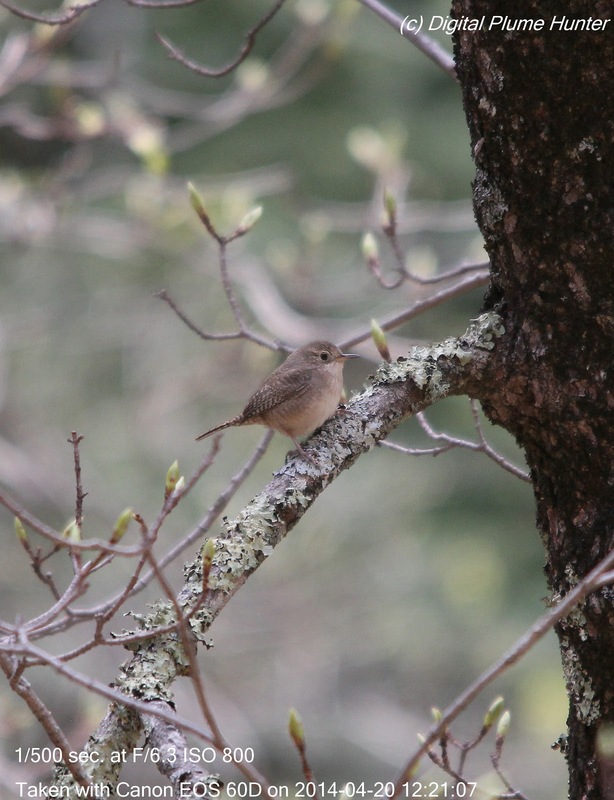 We are fortunate that the Gnatcatchers and Wrens are especially well represented in the New World (indeed Gnatcatchers are exclusive to the Americas). 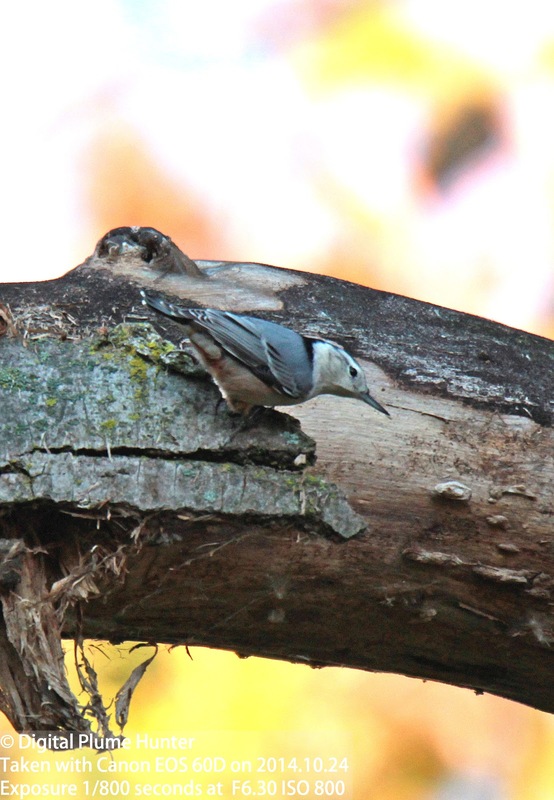 Treecreepers and Nuthatches, on the other hand, are much more richly represented in the Old World. 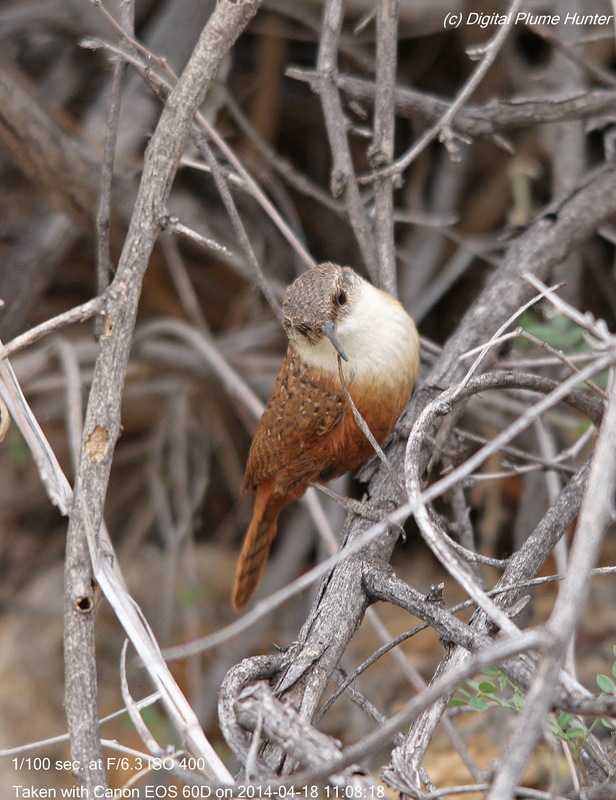 One is first alerted to the presence of the Canyon Wren by its incredibly loud song -- a burst of tightly spaced whistled notes that gradually grow longer (and lower pitched) and conclude with a grating squawk. 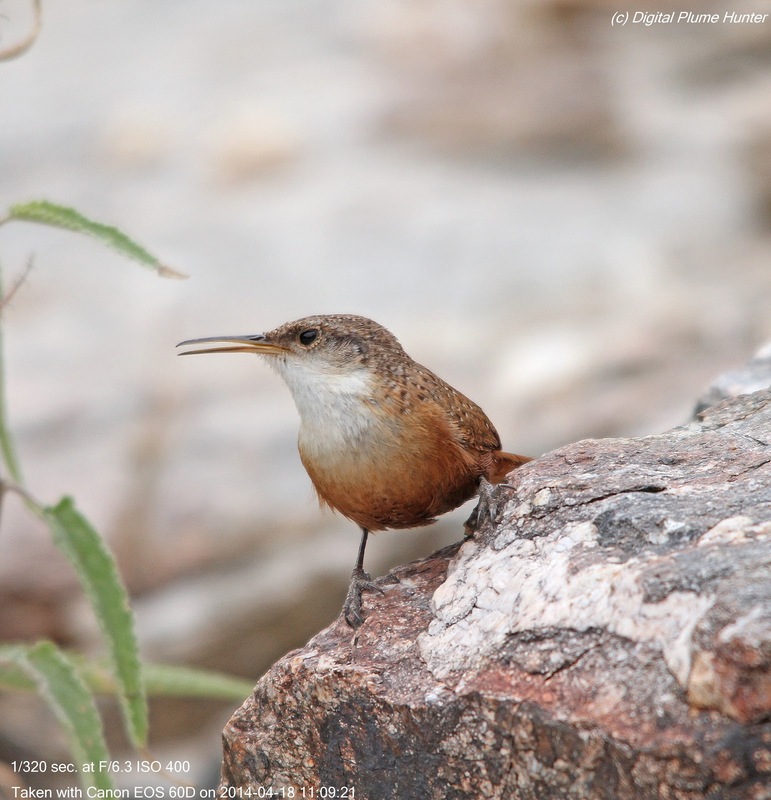 Ranging all across the West, our most distinctive wren is a crevice specialist with an uncanny ability to flatten its body to forage in impossibly tight spaces. 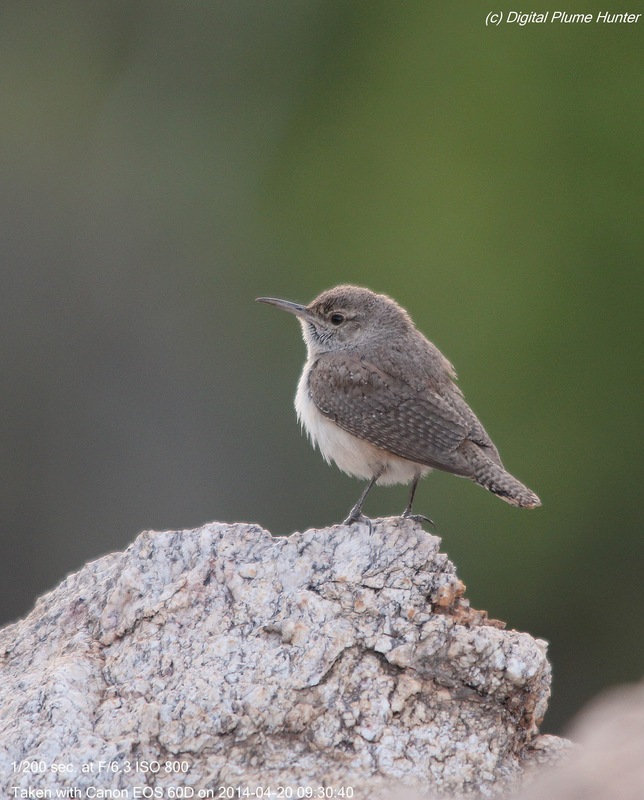 The aptly named Rock Wren, compared to the Canyon Wren, is both stockier and greyer. 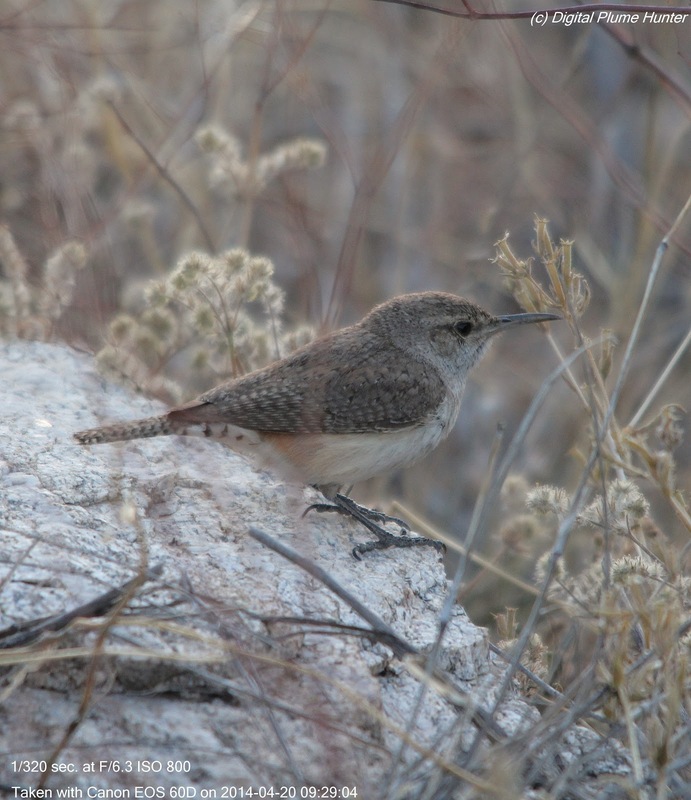 However, in song, the Rock Wren is equally (and perhaps more) accomplished. 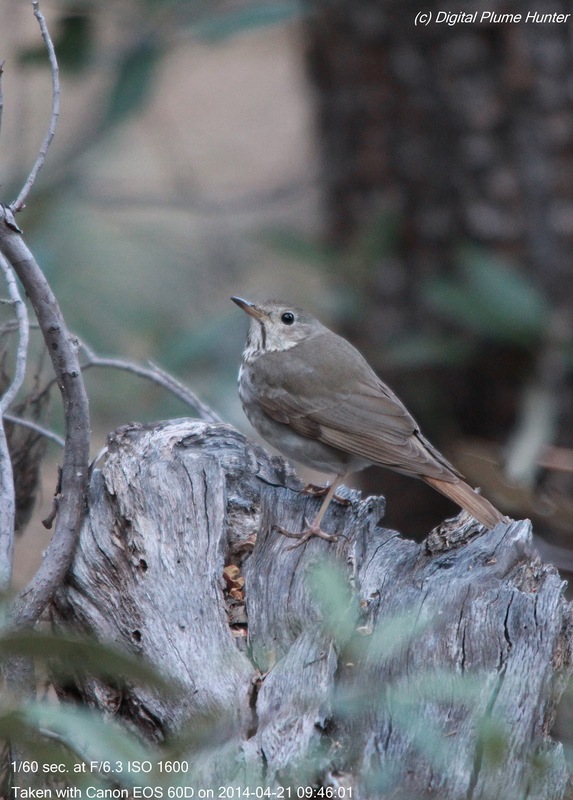 Sadly, its population is declining across its Western range. 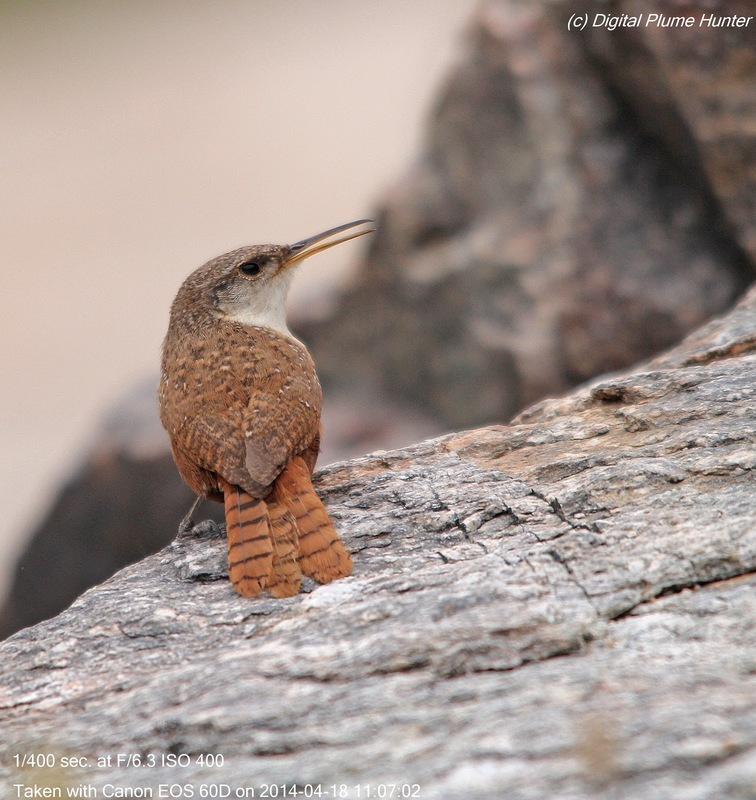 Our next wren is the humble House Wren. 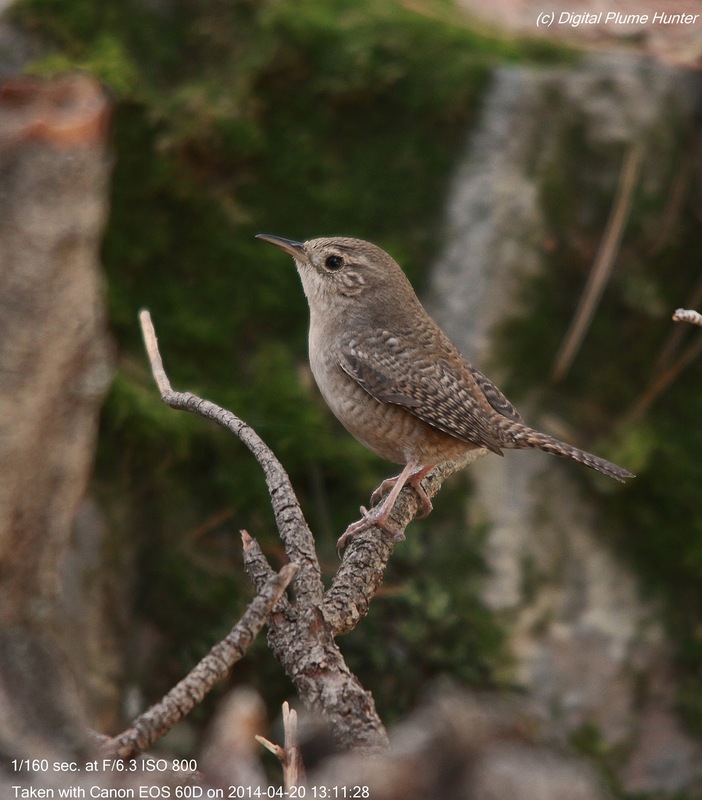 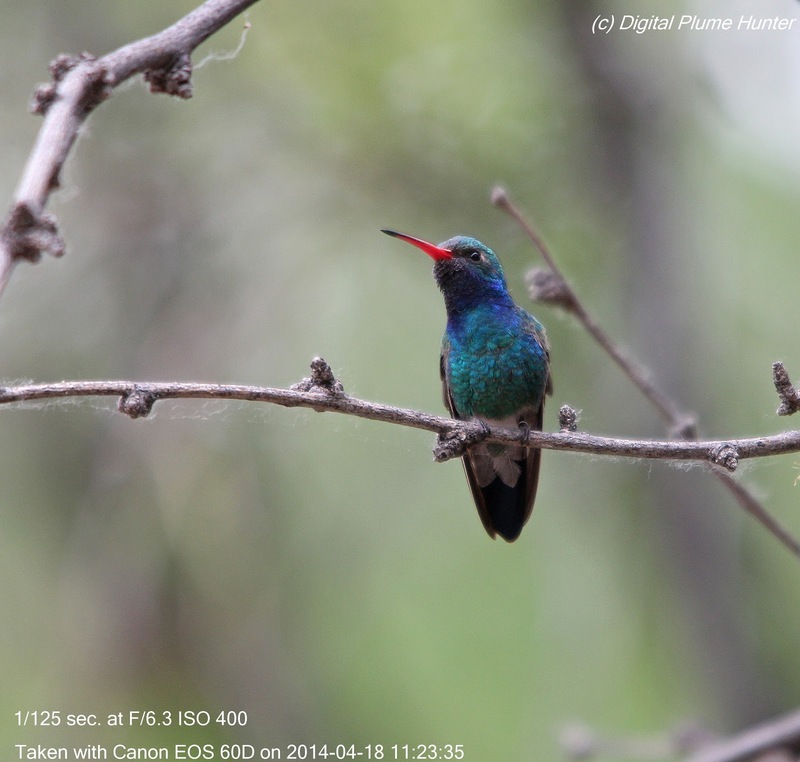 This songbird has one of the largest ranges of any bird in the New World ranging from Argentina to Canada. 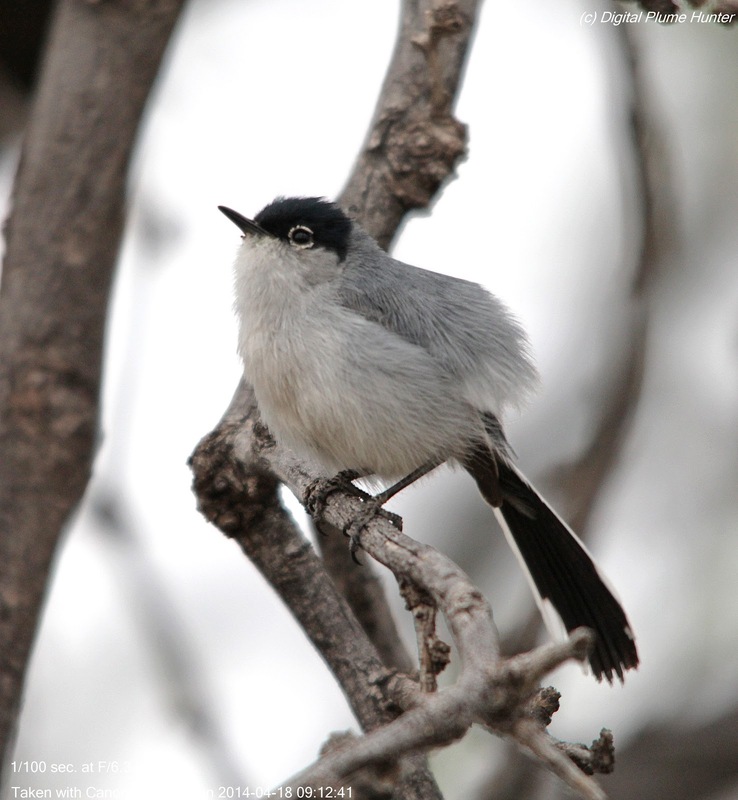 It is a cavity nester and population trends are fairly stable. 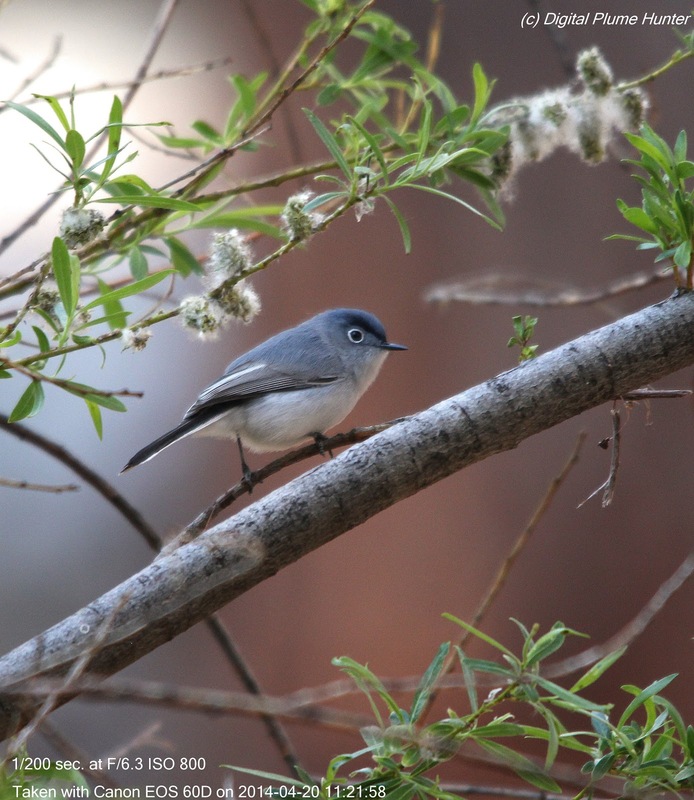 Unlike the Blue-grey Gnatcatcher (above) which enjoys widespread distribution across the US, the Black-tailed Gnatcatcher is found in a small range close to the Mexican border from Texas westwards. 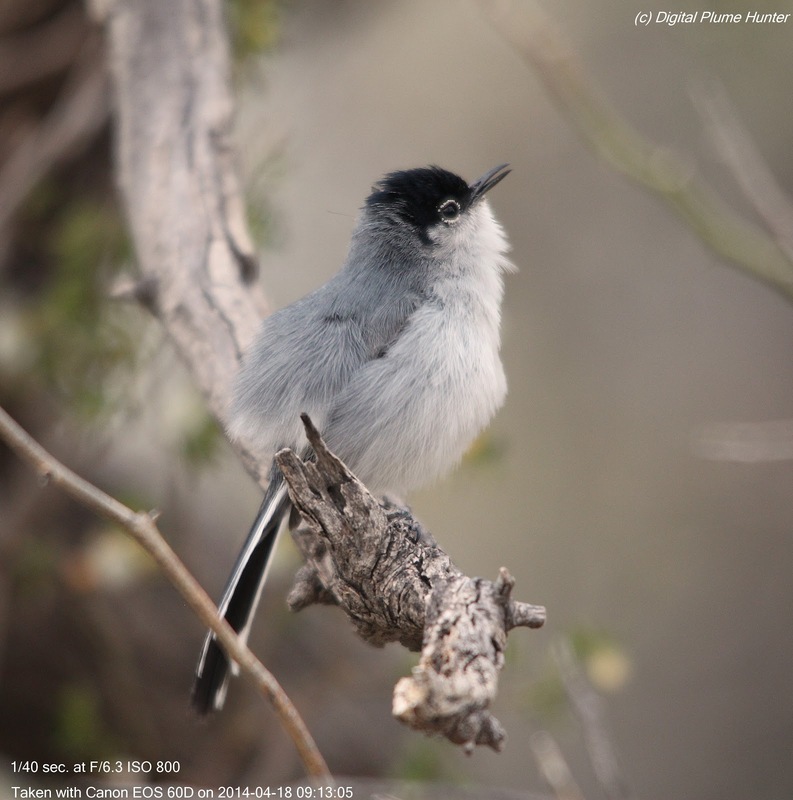 While disambiguating the Black-tailed Gnatcatcher from the Blue-grey may be problematic in Winter, in alternate plumage the identification is a cinch thanks to the spectacular black cap and flamboyant white-edged black tail. 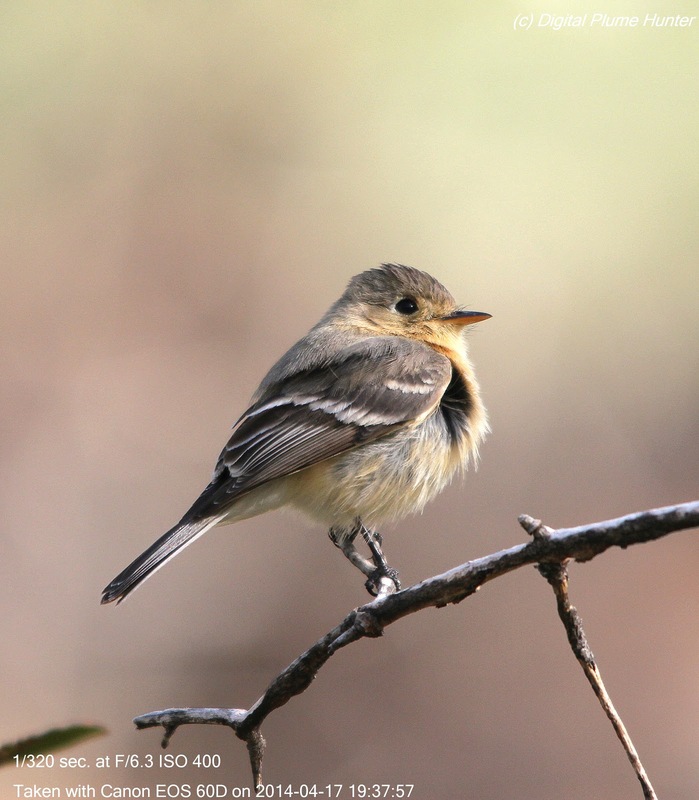 Described by George Newbold Lawrence (of Lawrence's Goldfinch fame), this tiny bird is a feisty insectivore but, unlike the Blue-grey, it does not hawk insects in the air; preferring instead, to glean them from leaves and branches. 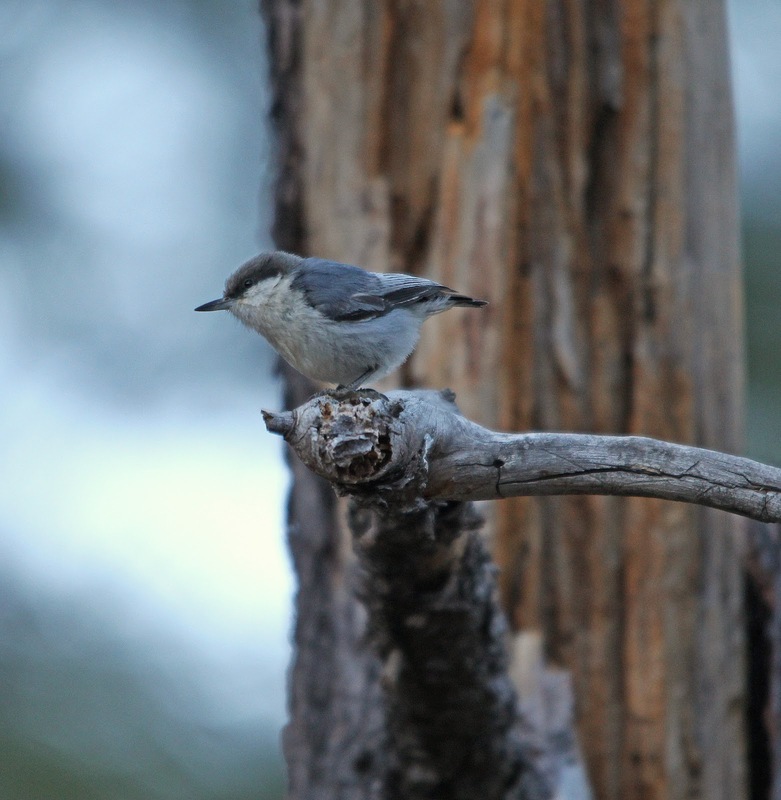 Competing with the Brown-headed Nuthatch for the title to our smallest nuthatch, this pair were observed next to their nest cavity on the descent to Rose Canyon on Mt. 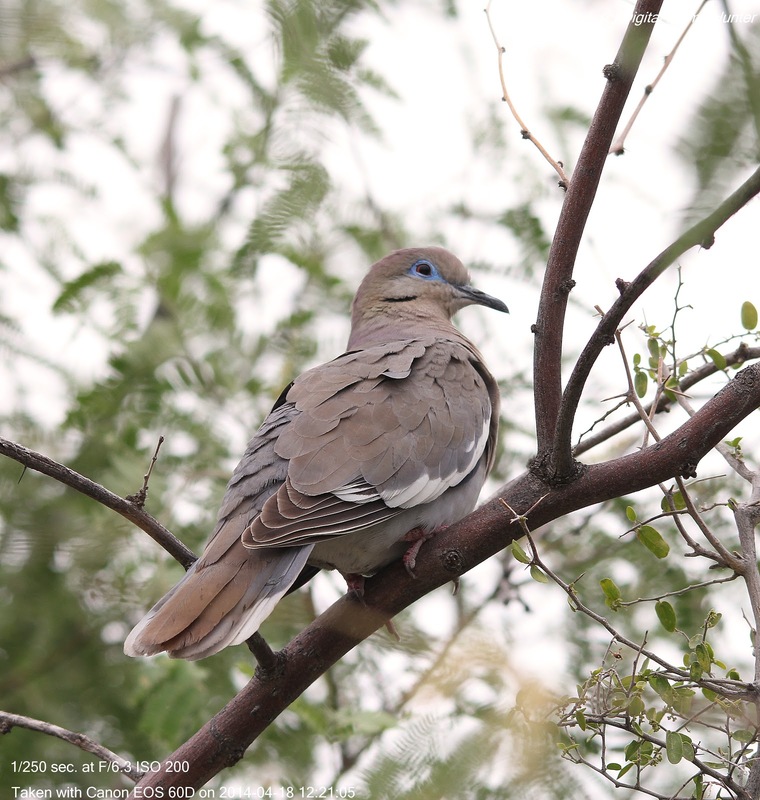 Lemmon. 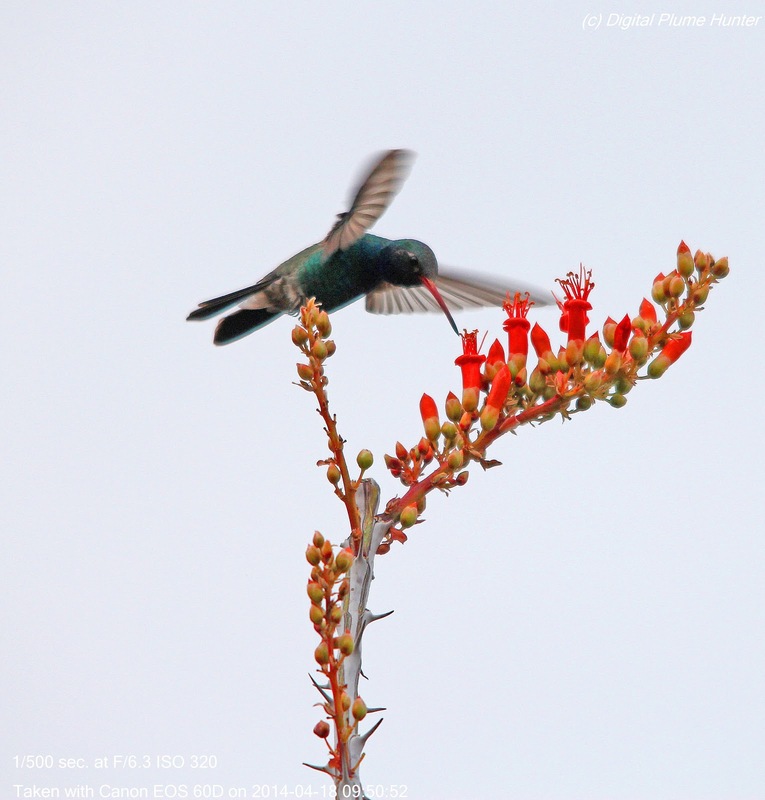 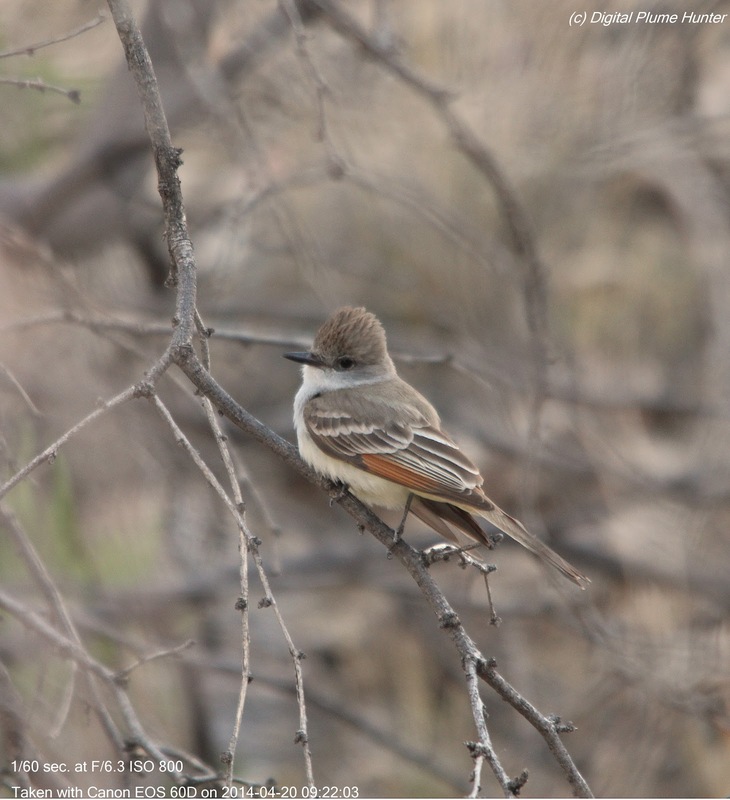 A magnet for those of the birding persuasion, SE Arizona is a treasure trove of stunning species some of which are found nowhere else in the US. 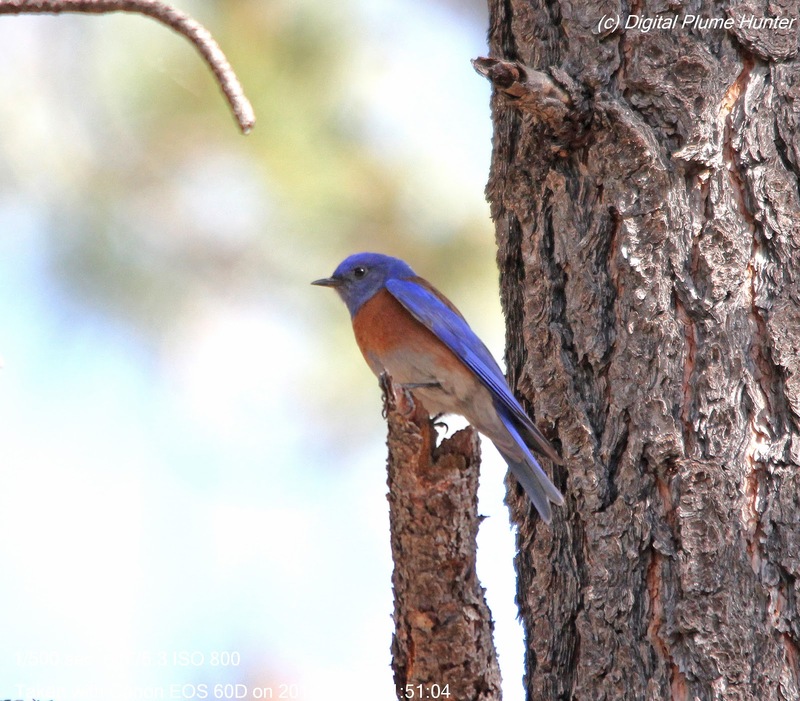 Having meant to publish this post originally in Spring, the esteemed readership of this blog is owed an explanation at to why a post originally conceived in April appears now a full 6 months later in October. 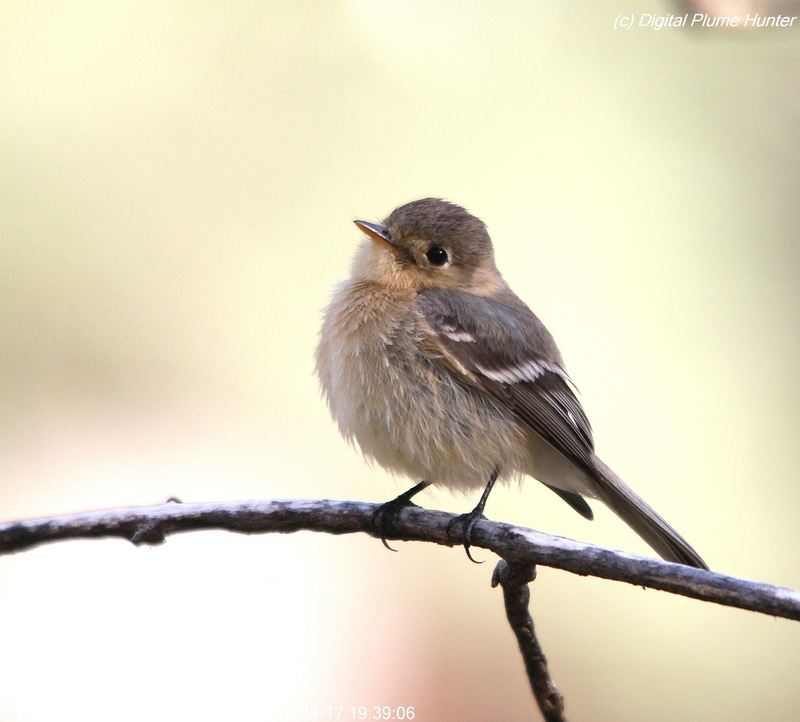 However, now, with the bulk of Fall migration activity behind us, we are afforded a brief interlude to "course correct" and return this Blog to a more predictable sequence of "observe and publish". 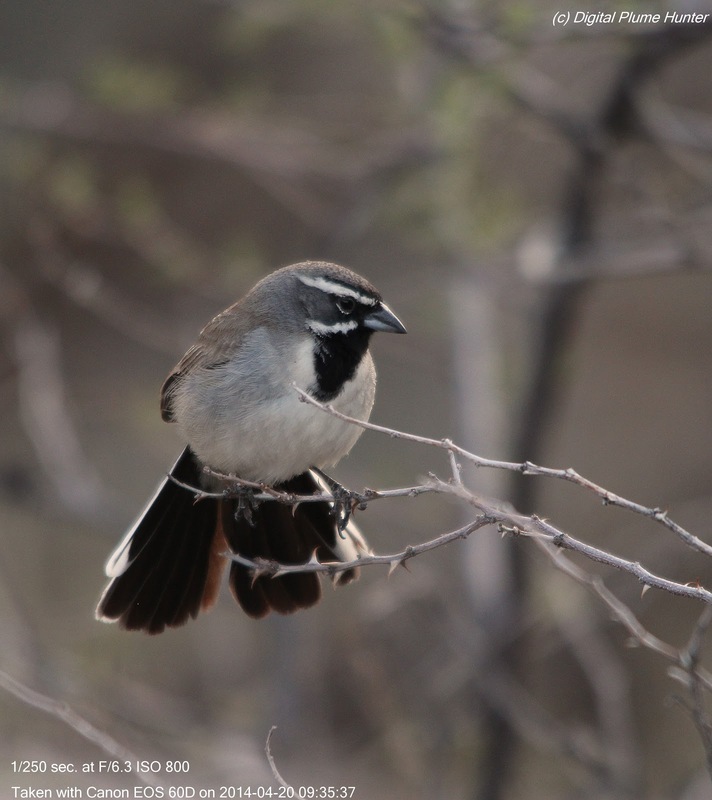 Black-throated Sparrow (not to be confused with the similar sounding Black-chinned Sparrow) is a handsome sparrow of the Southwest. 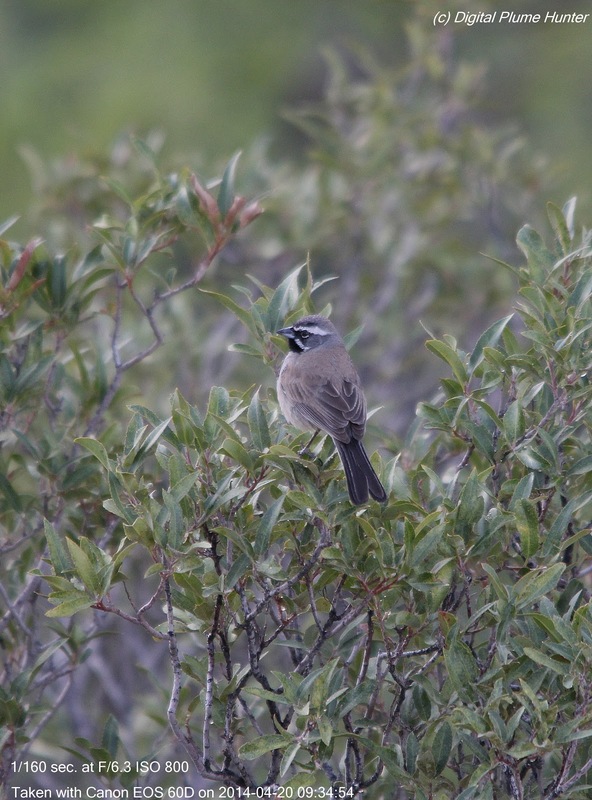 Somewhat unusual for sparrows, its color scheme has no tans or browns -- just grey and black. 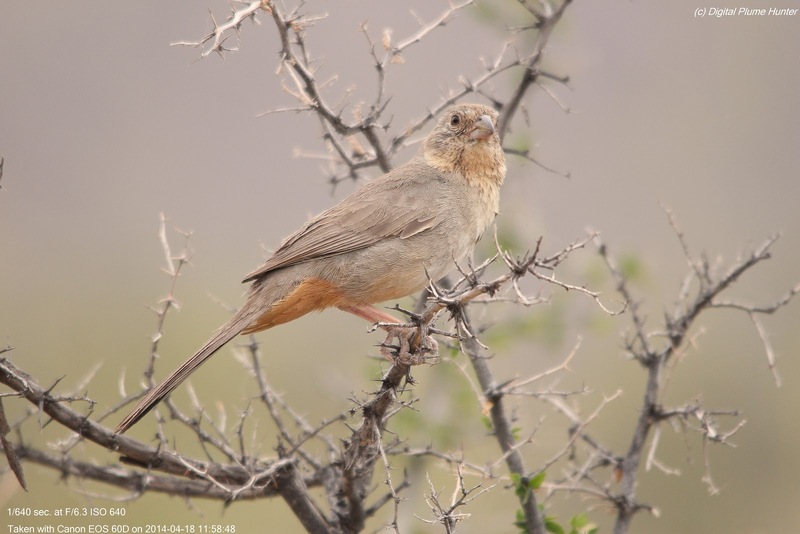 The Canyon Towhee is a large new world sparrow. 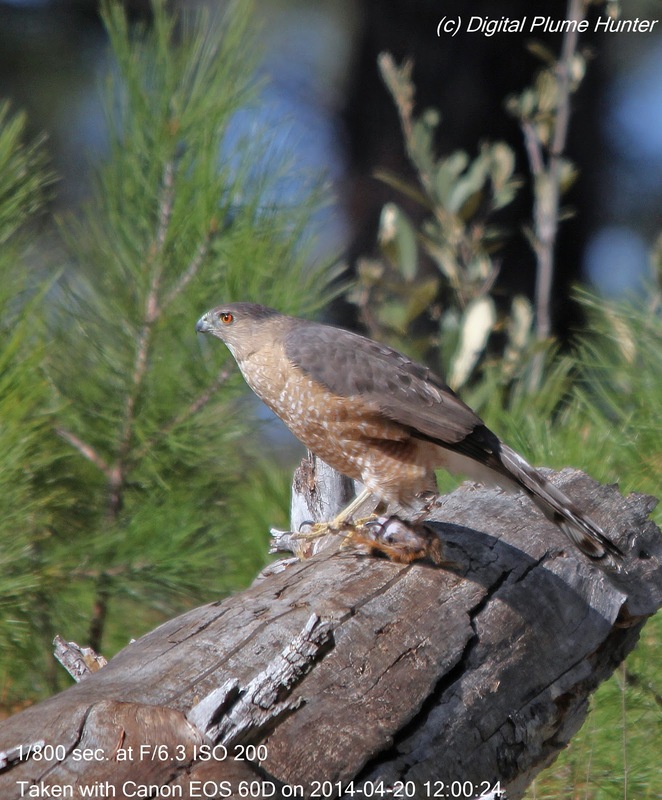 Generally inconspicuous, they are more likely to be found on the ground than perched. 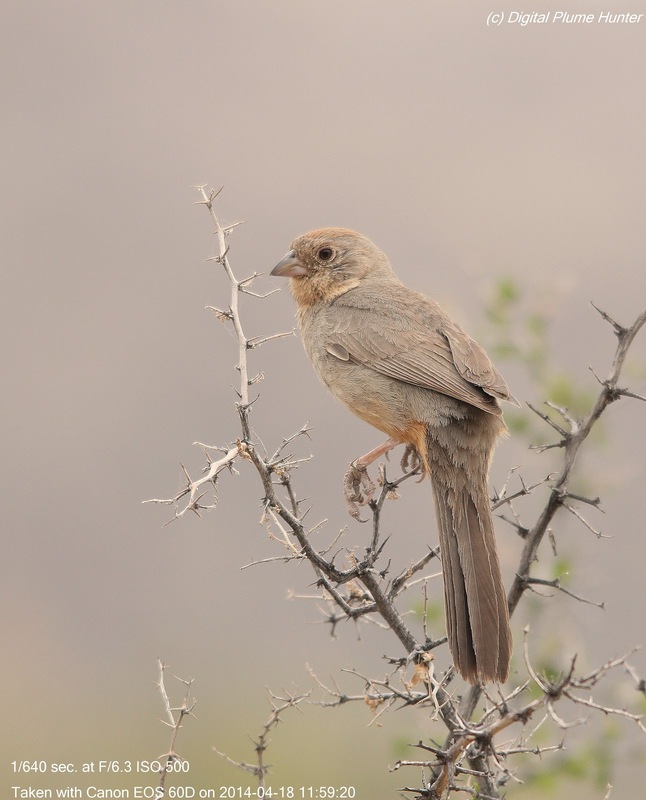 It, and the similar California Towhee were once considered to be the same species. 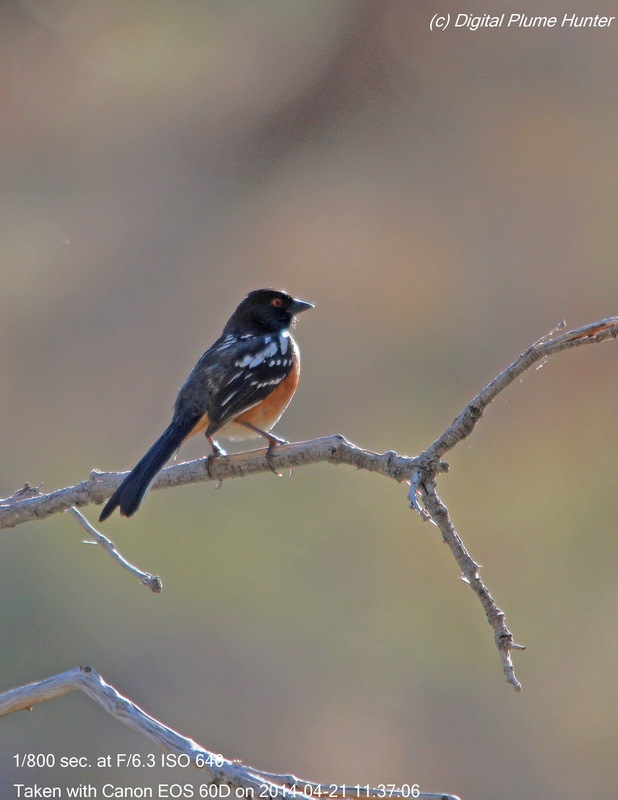 Looking like an Eastern Towhee but with spots on the wings, this boldly colored, large sparrow is a common sight in the Western US ranging from British Columbia to California. 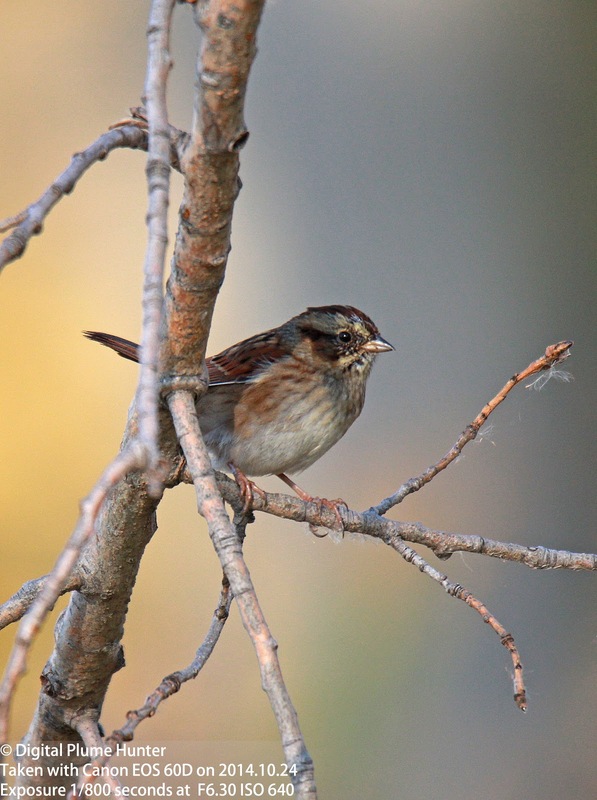 Perhaps the most delightful of our sparrows are the Junco's. 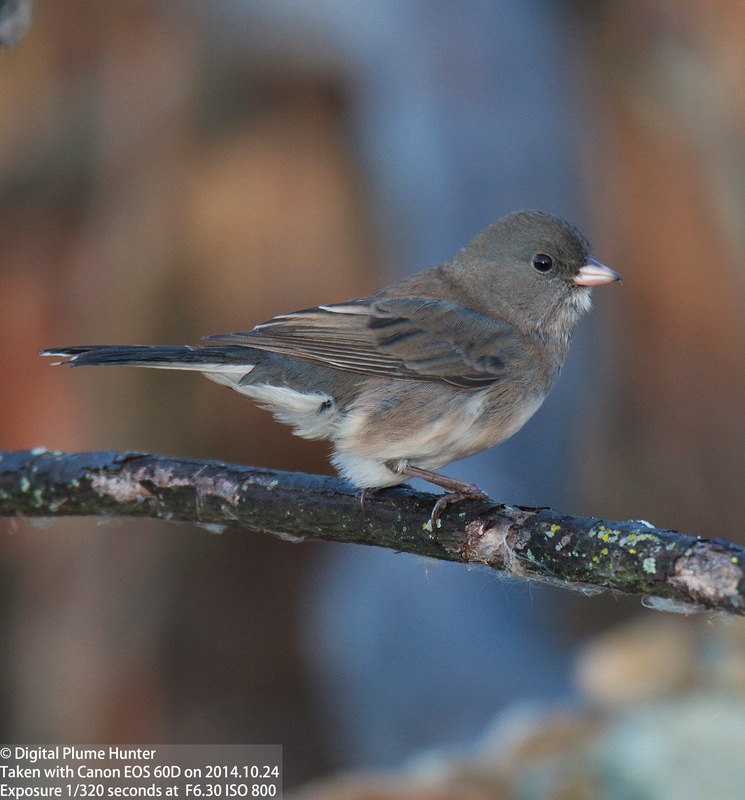 And the most delightful of our Junco's is the Yellow-eyed -- this is our only sparrow with yellow eyes. 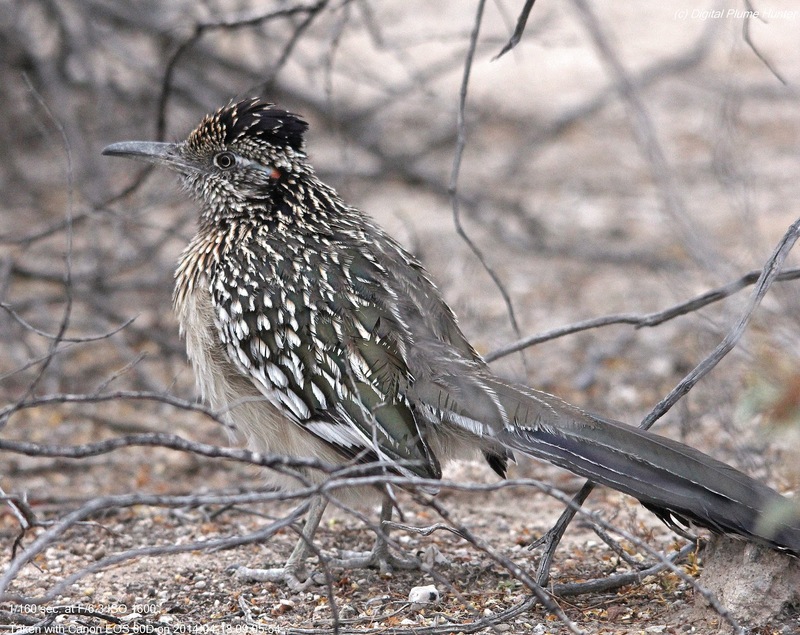 This Mexican bird barely extends into our territory in the Southern reaches of Arizona and New Mexico. 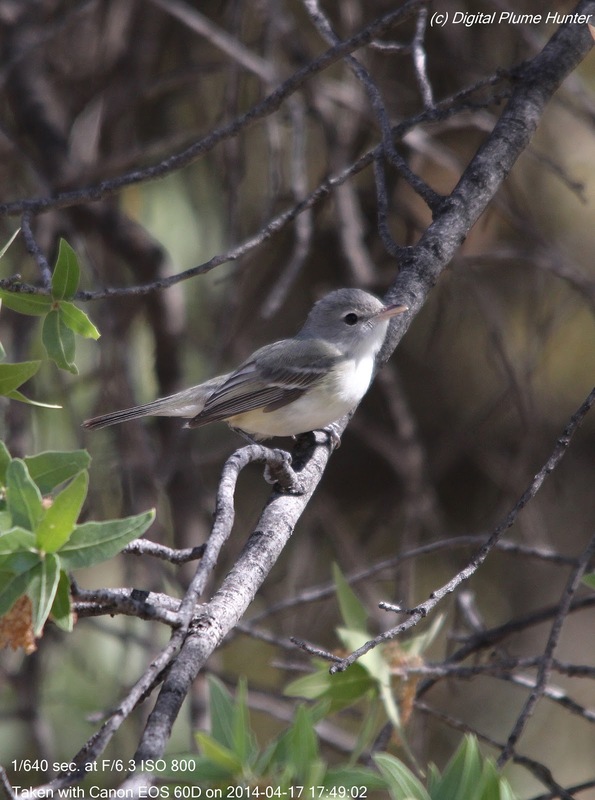 Bell's Vireo is a tiny vireo found from the West to the Central US. 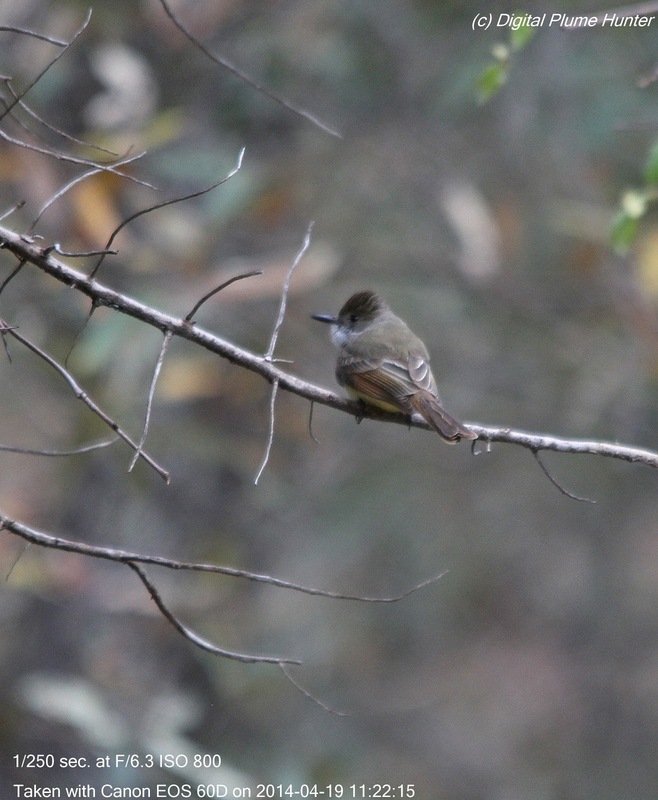 Interestingly, the color changes from grey to yellow moving Eastward. 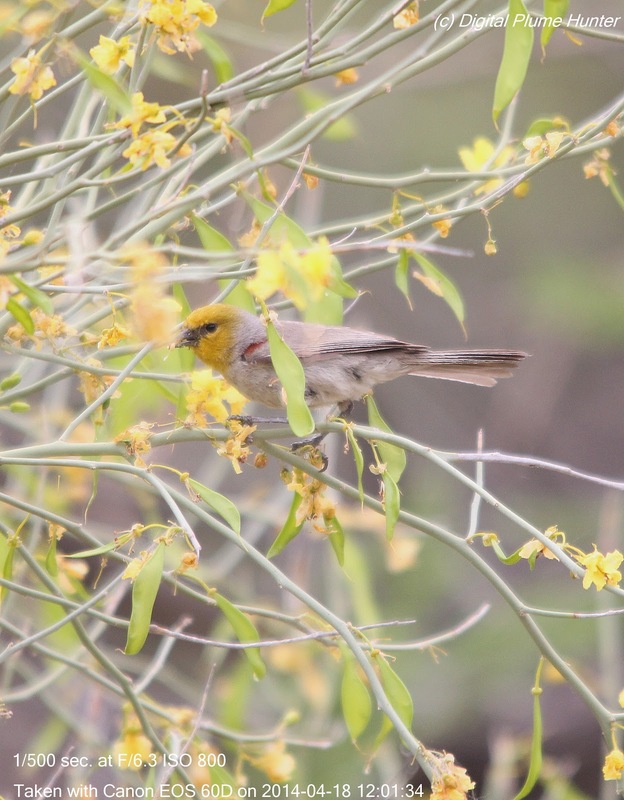 Thus, the specimen shown here (observed in Arizona) is largely grey with just a hint of yellow. 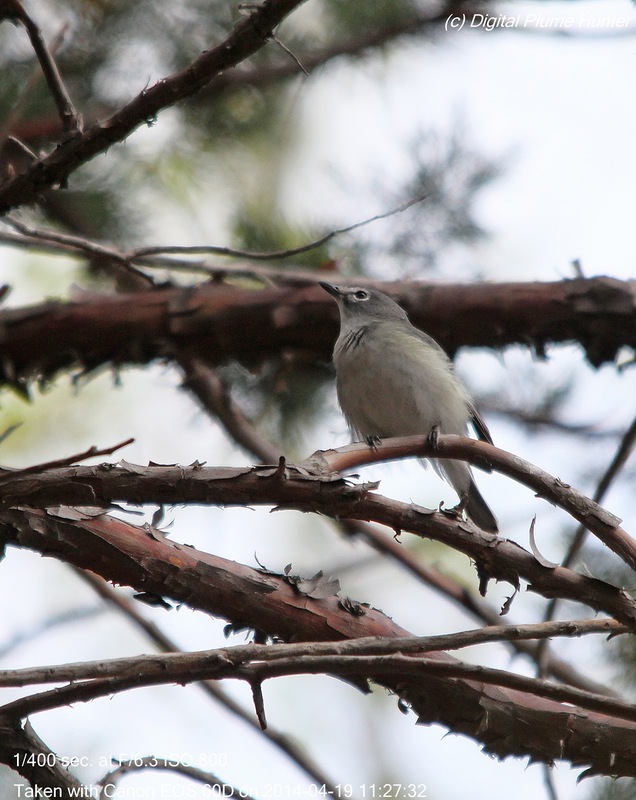 Plumbeous Vireo, unlike Bell's is altogether grey. 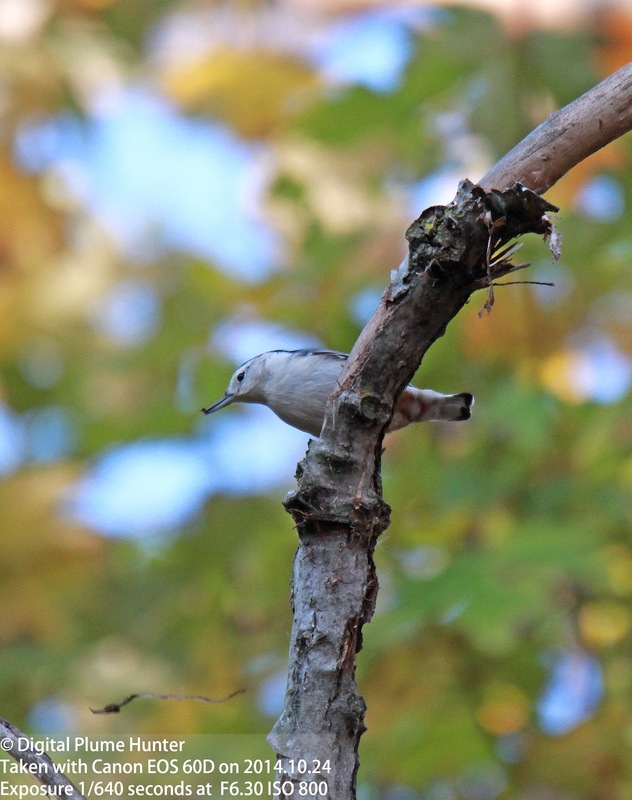 If its white spectacles are reminiscent of Blue-headed Vireo, it will be no surprise to learn that they were once considered to be the same species. 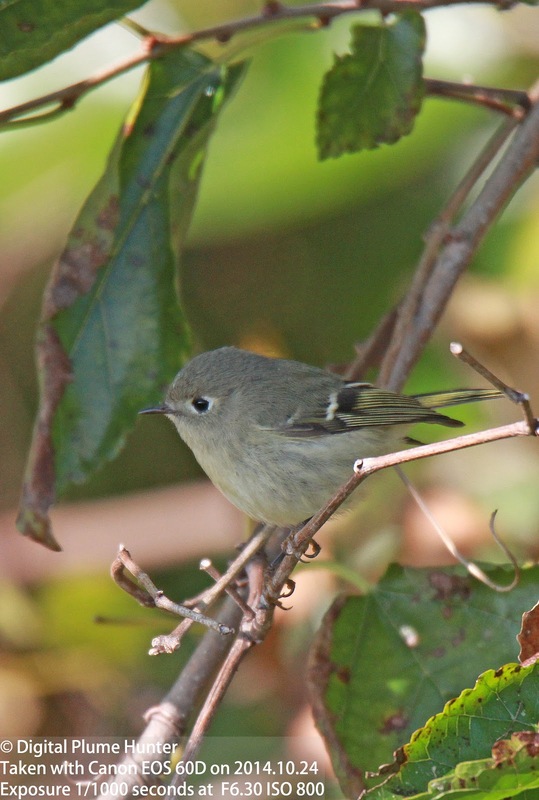 Of course, unlike Blue-headed, Plumbeous Vireo does show the green that is typical of most vireos. 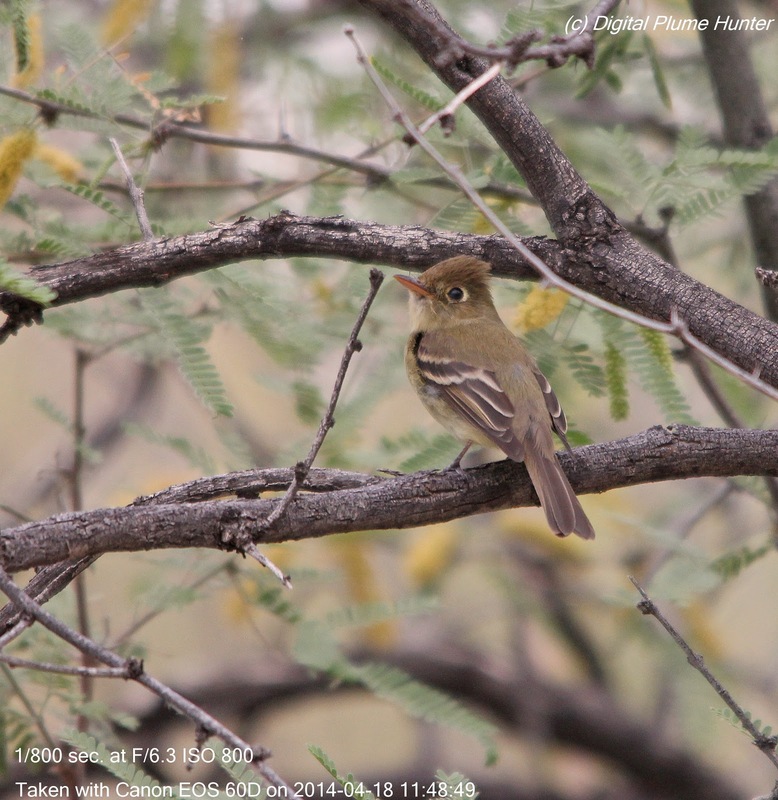 "Late", it is said, is better than "Never" and it is hoped that this post of signature birds of SE Arizona provides ample testimony in support of the veracity of the adage.